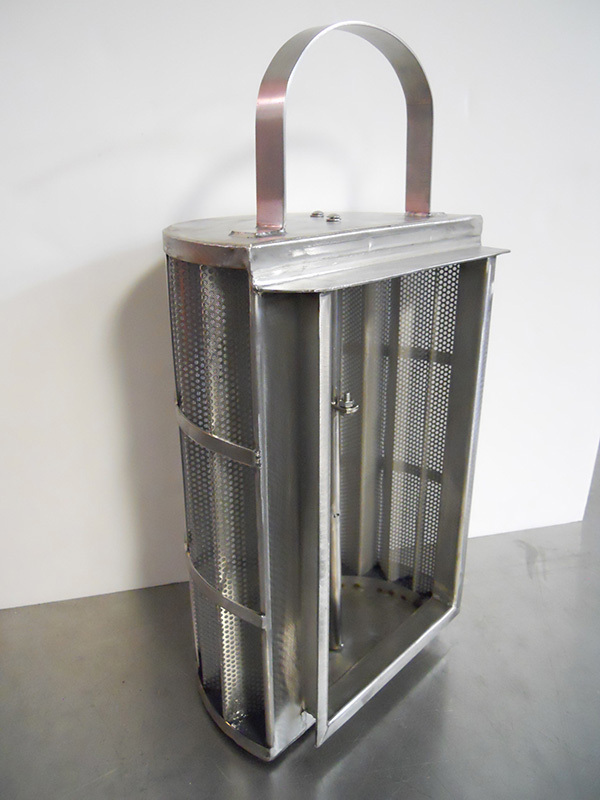 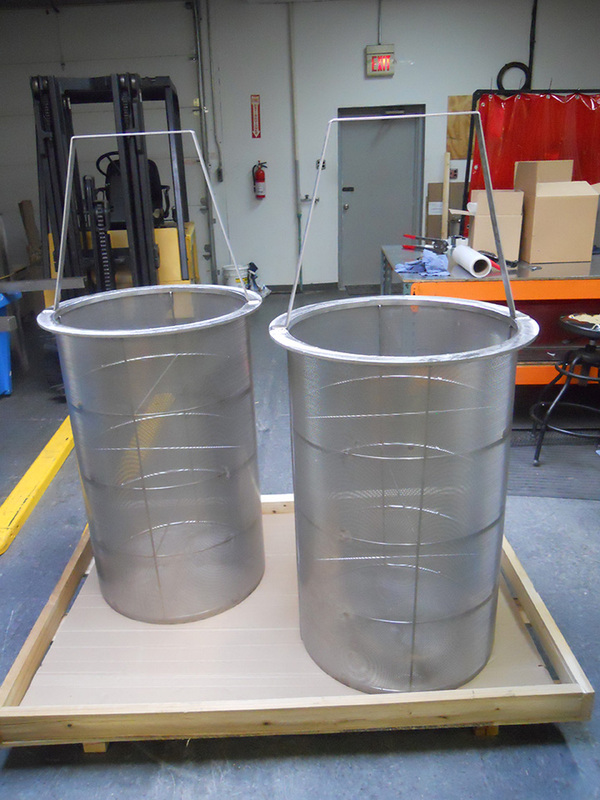 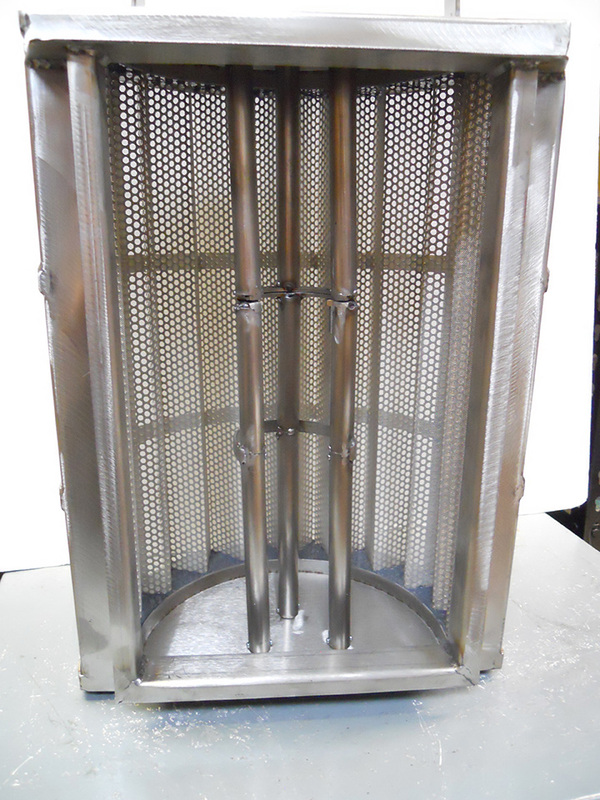 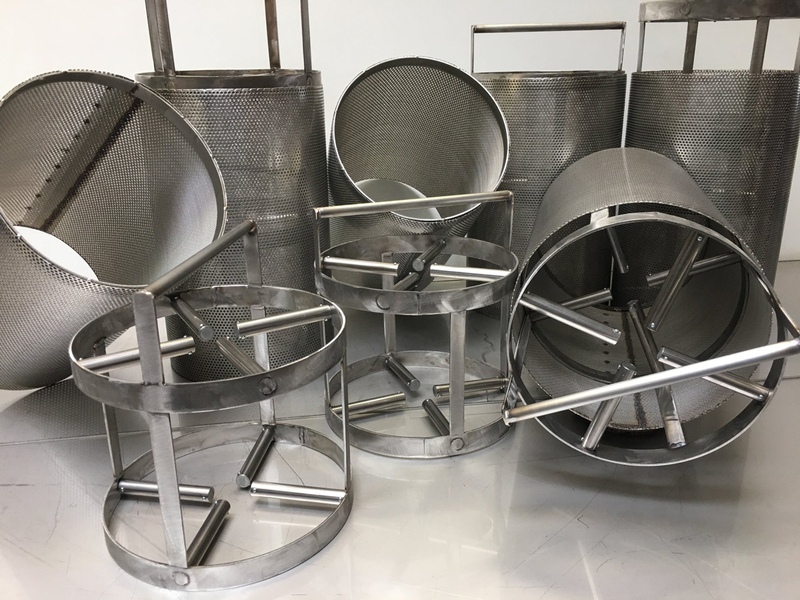 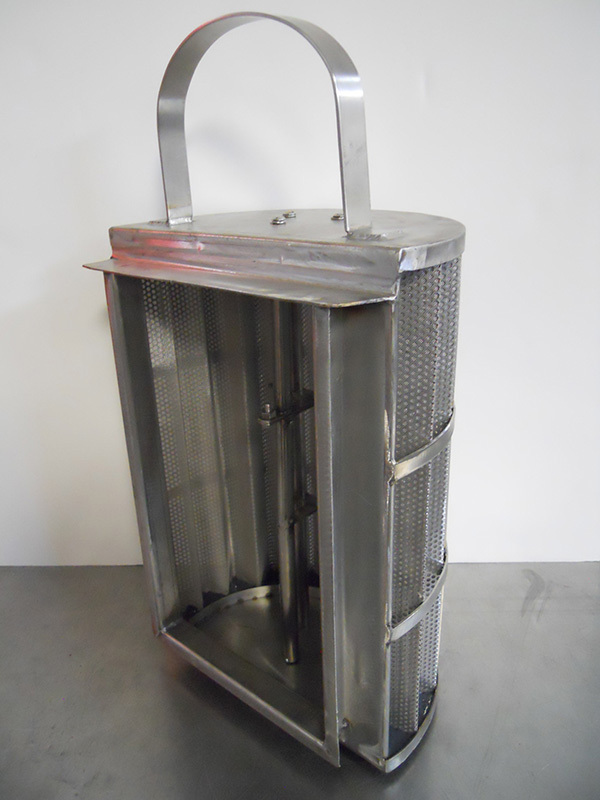 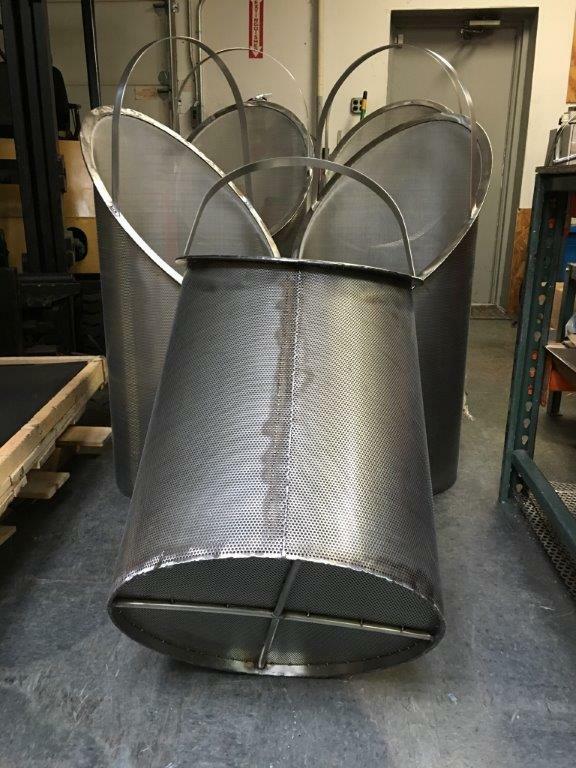 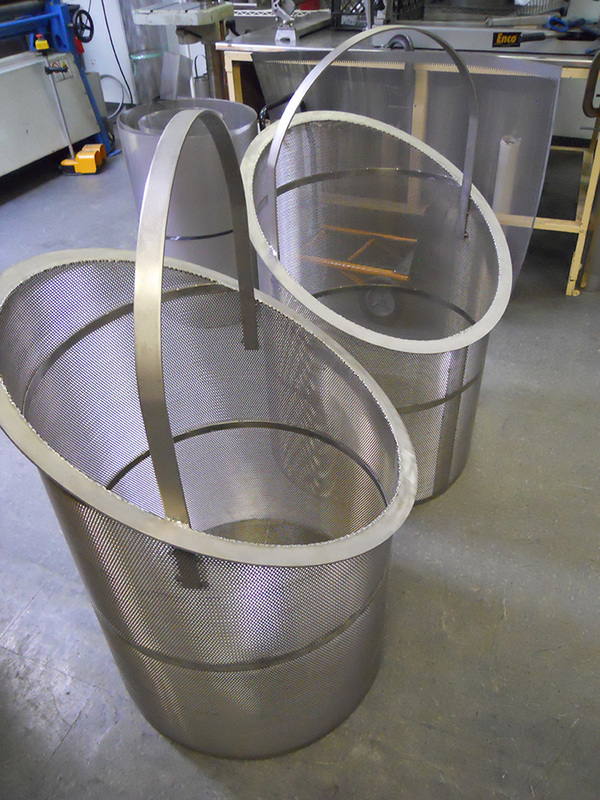 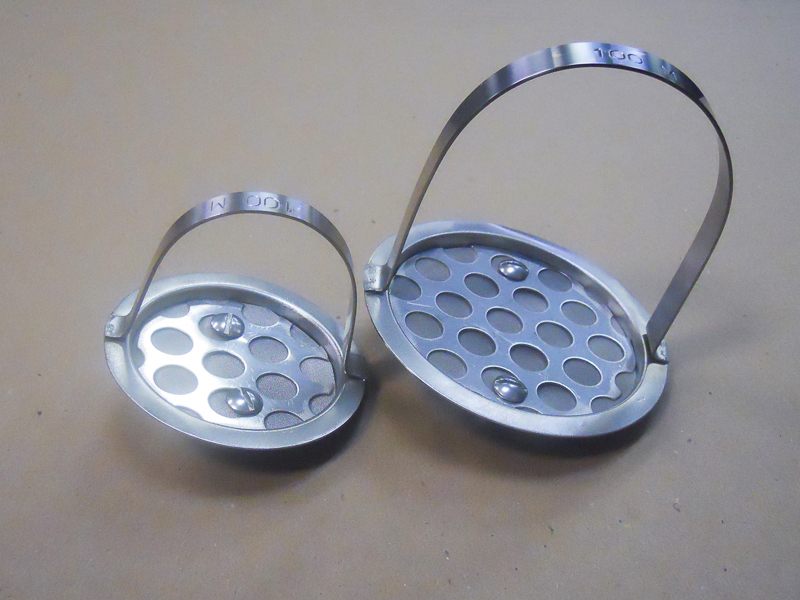 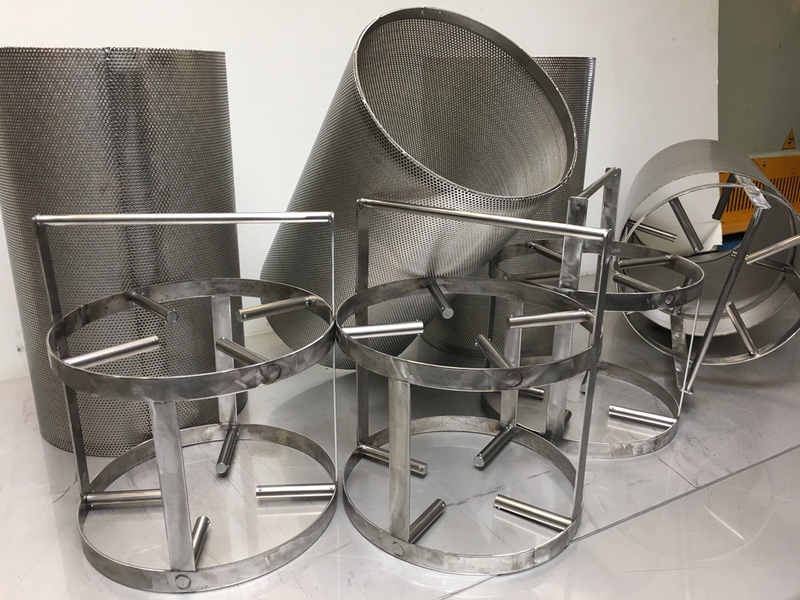 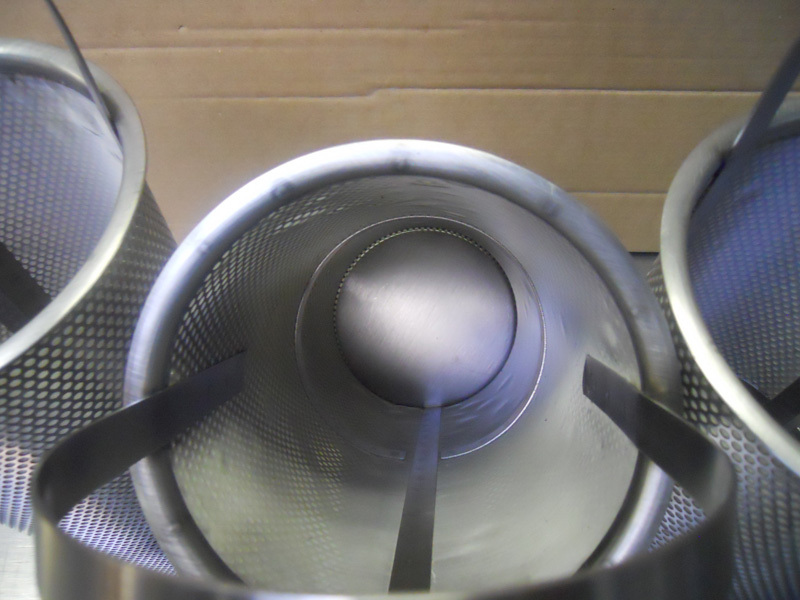 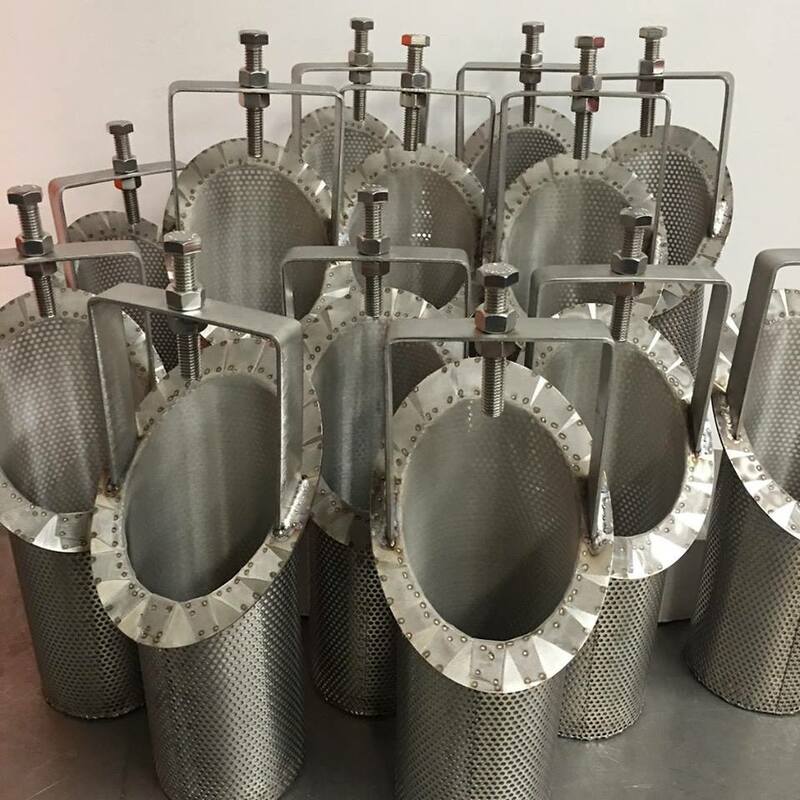 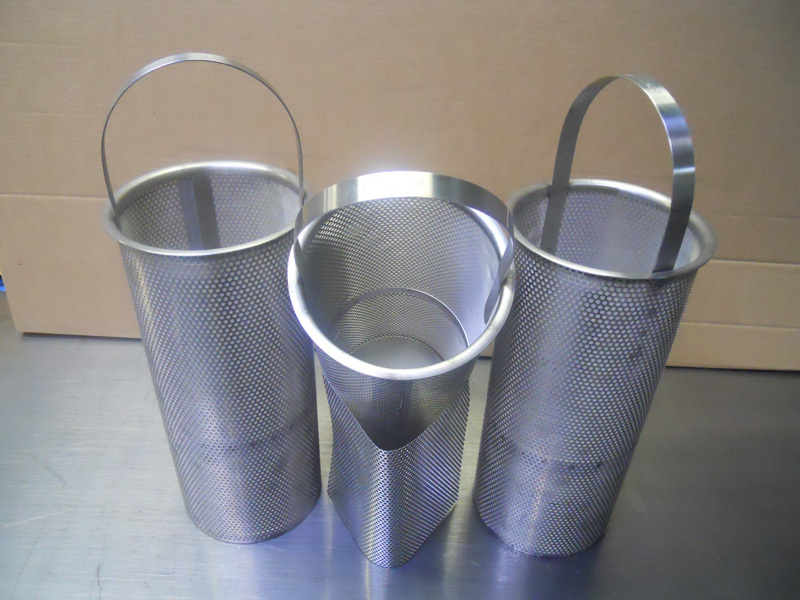 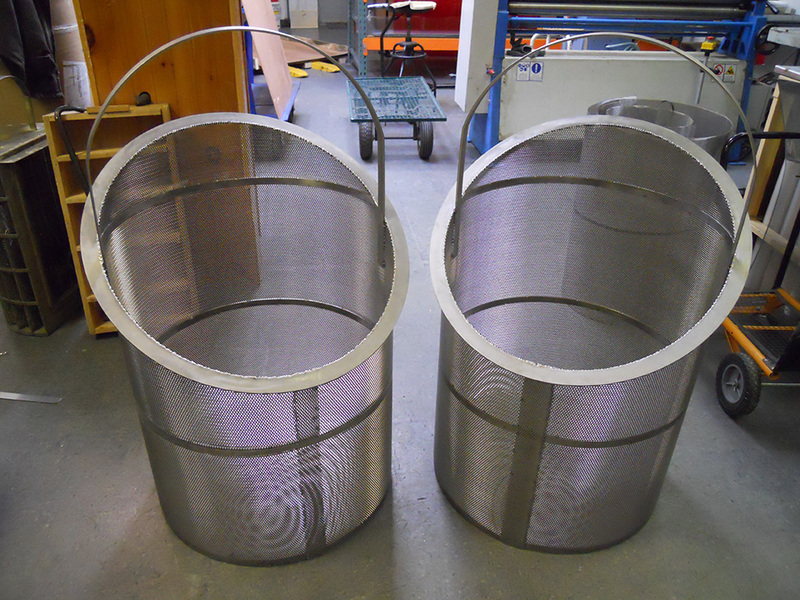 We manufacture and replace all types of screens, baskets, strainers in different alloys for exsisting and discontinued OEM products. 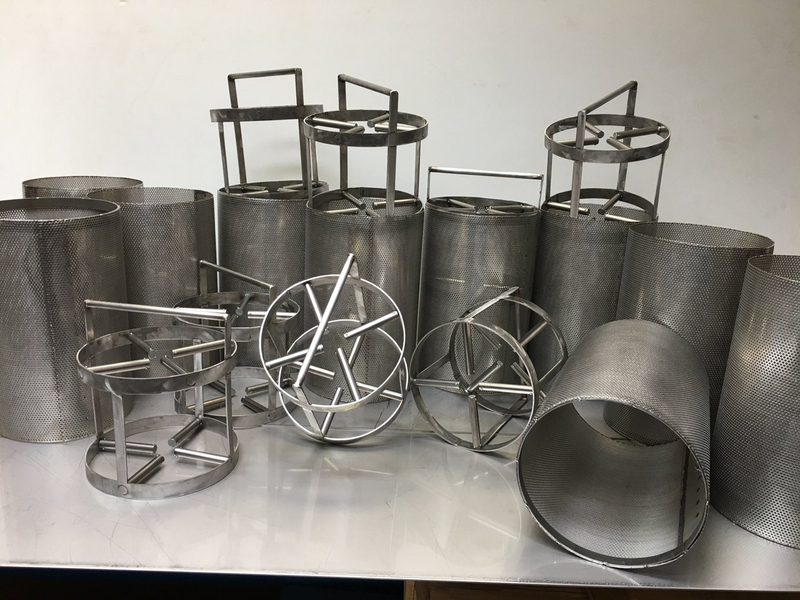 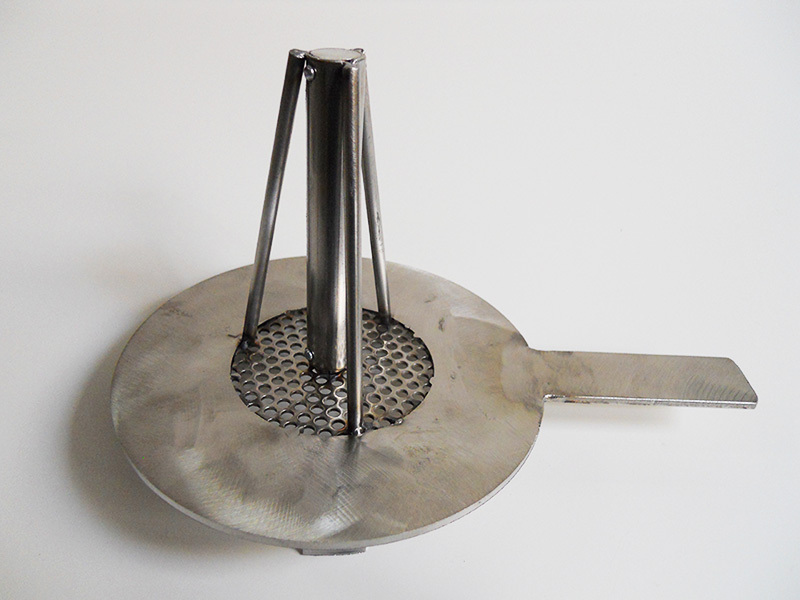 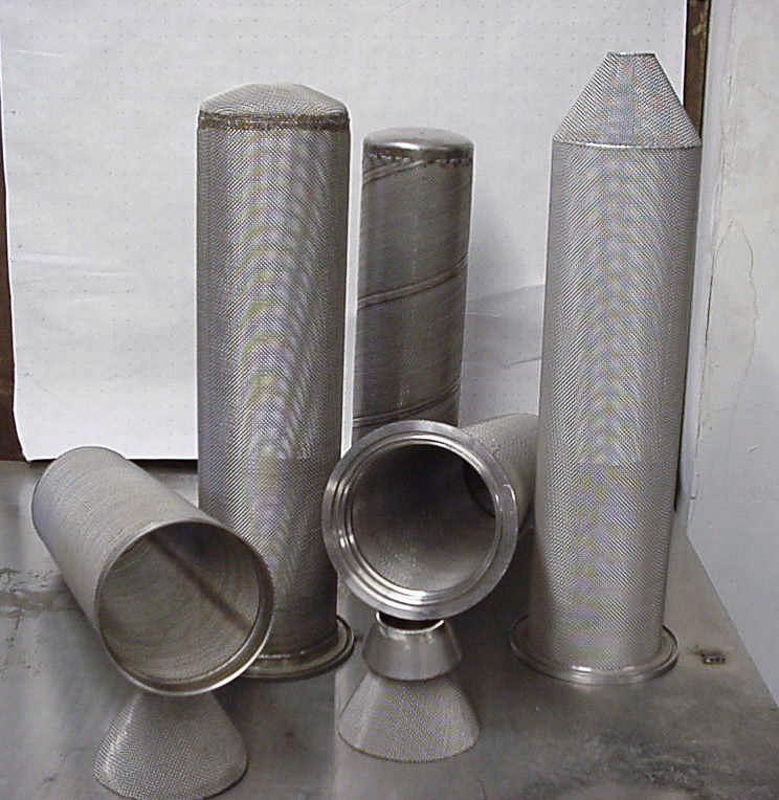 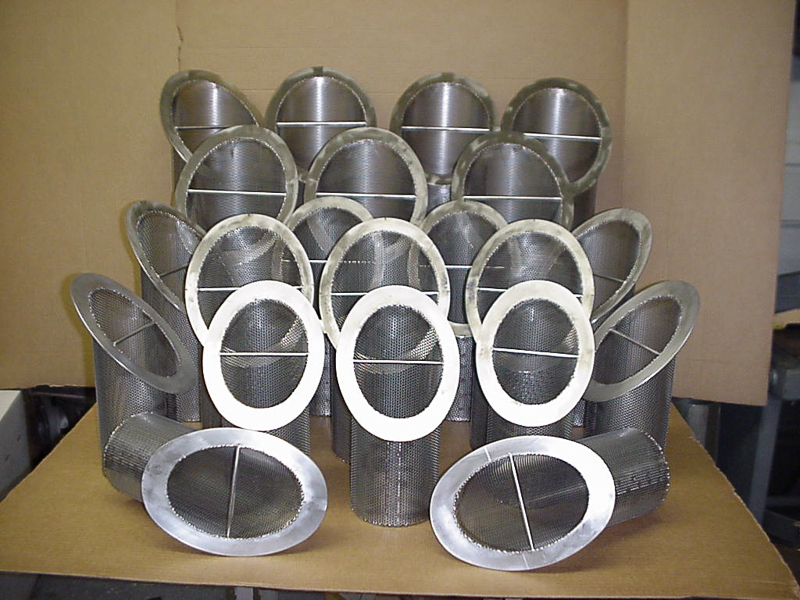 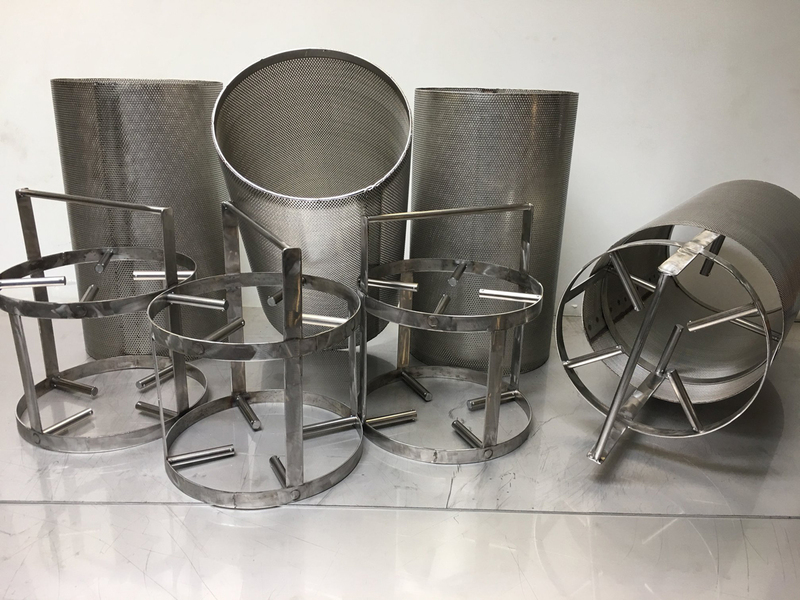 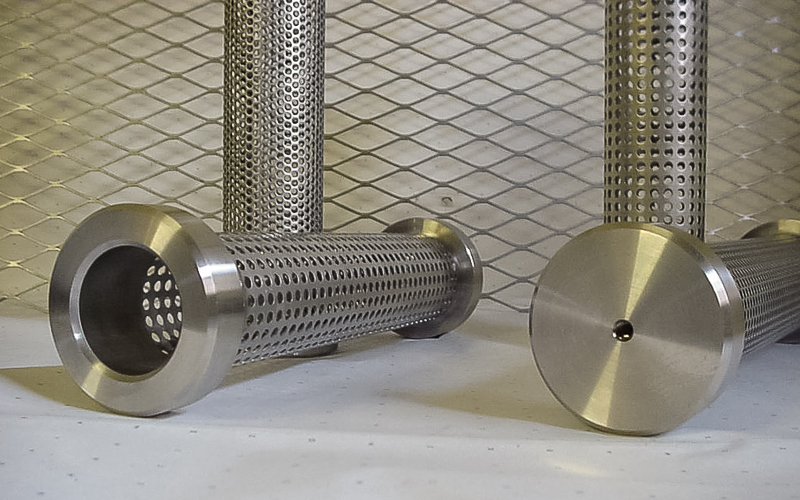 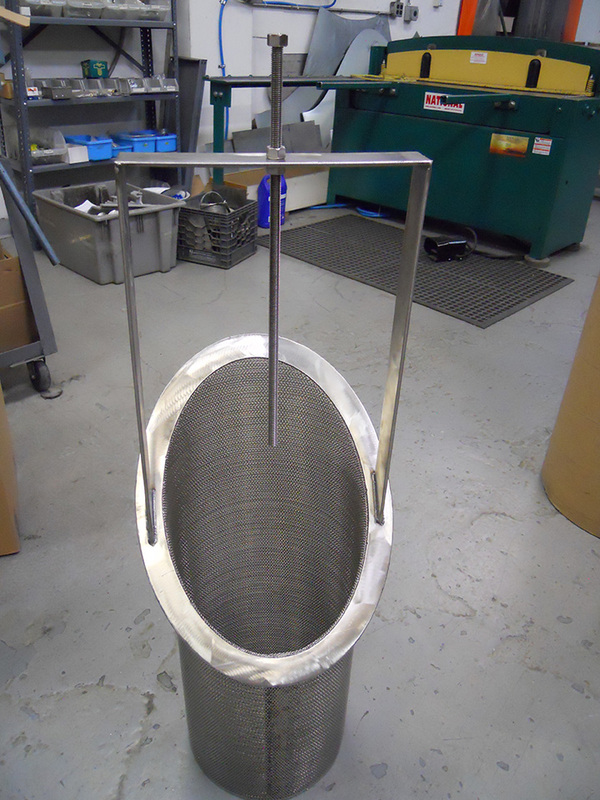 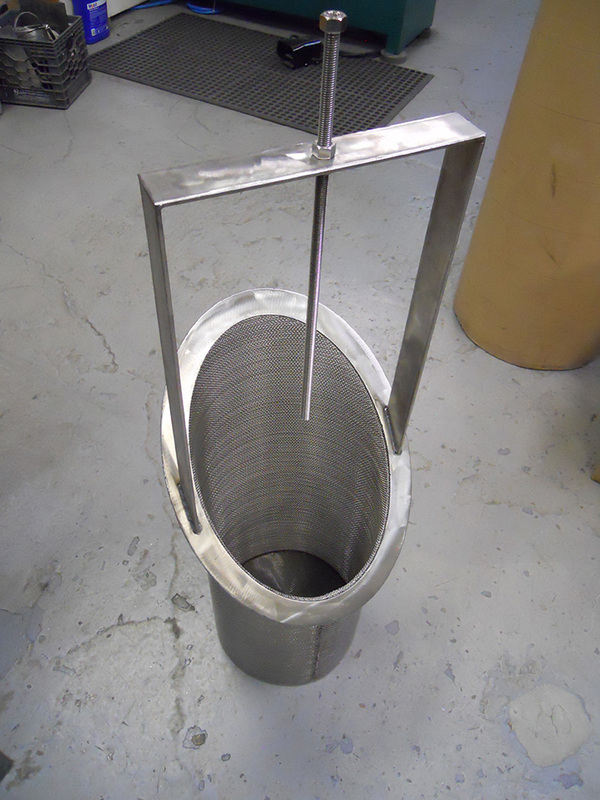 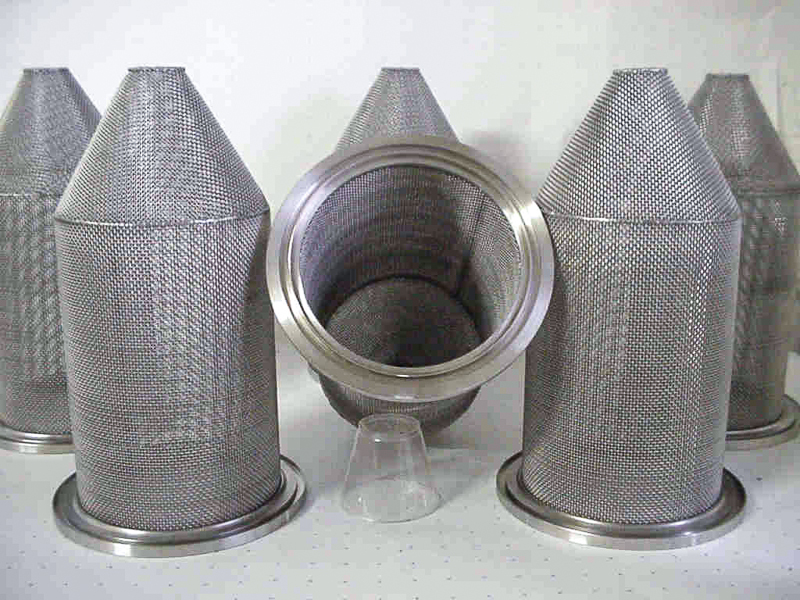 Replacement strainers, baskets and individual screens are available separately in all sizes, peforations, mesh, and alloys for Smith Meters, Brooks Meters, and Daniel Meters. 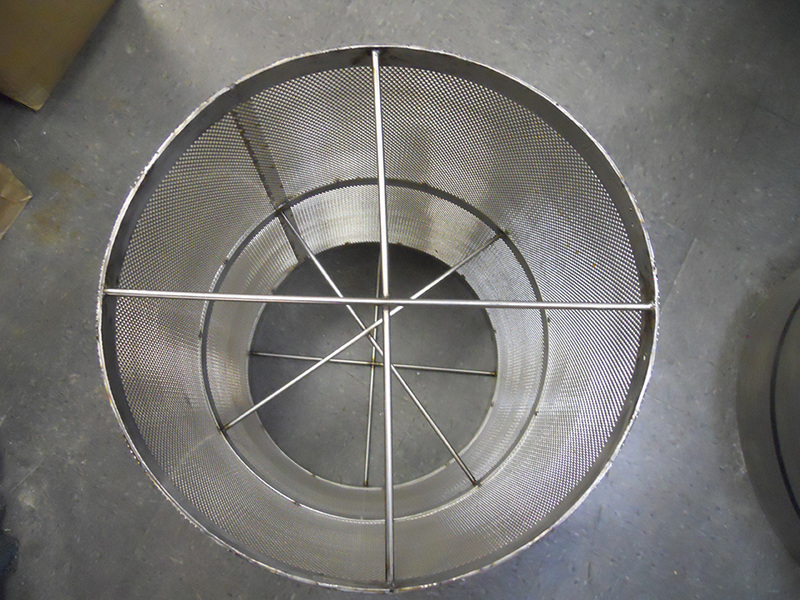 Tate Andale replacement basket with custom Stainless Steel flange used to replace old cast iron flange for a stonger and longer lasting basket. 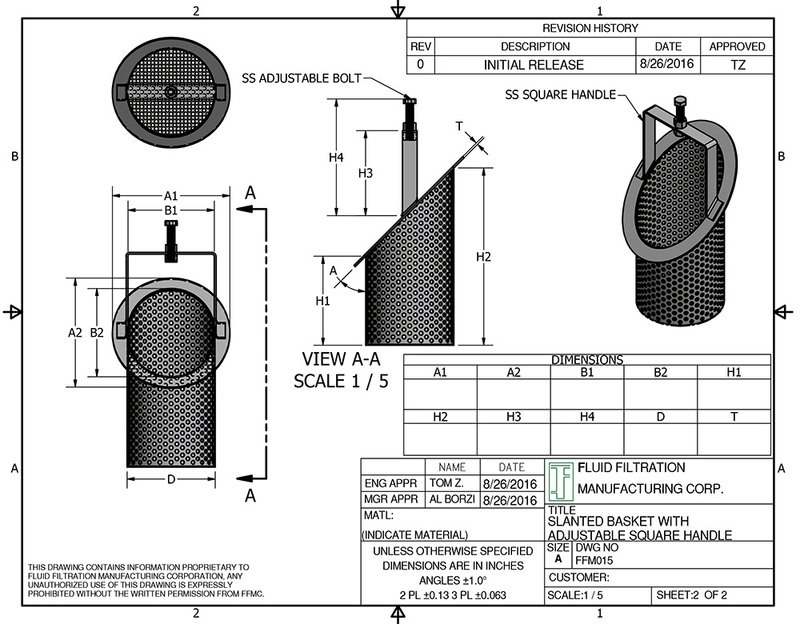 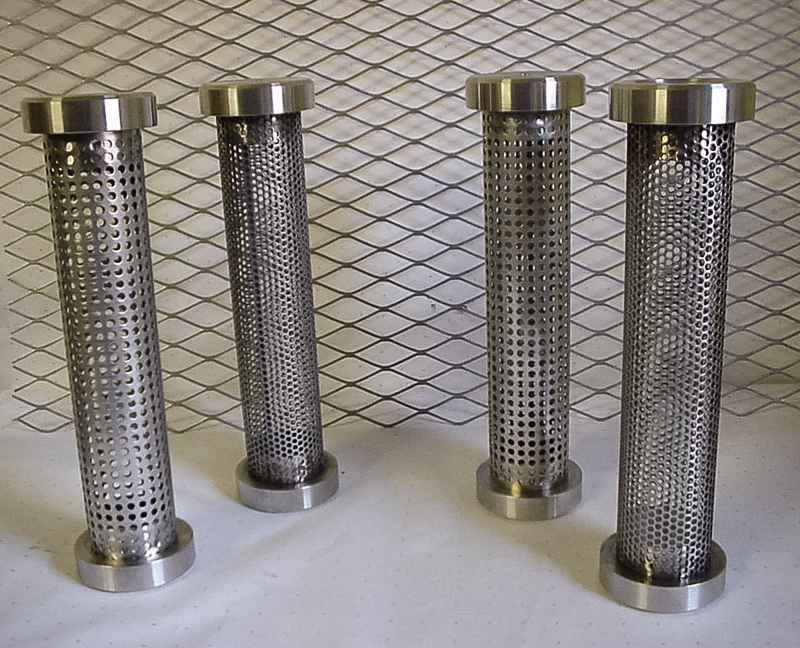 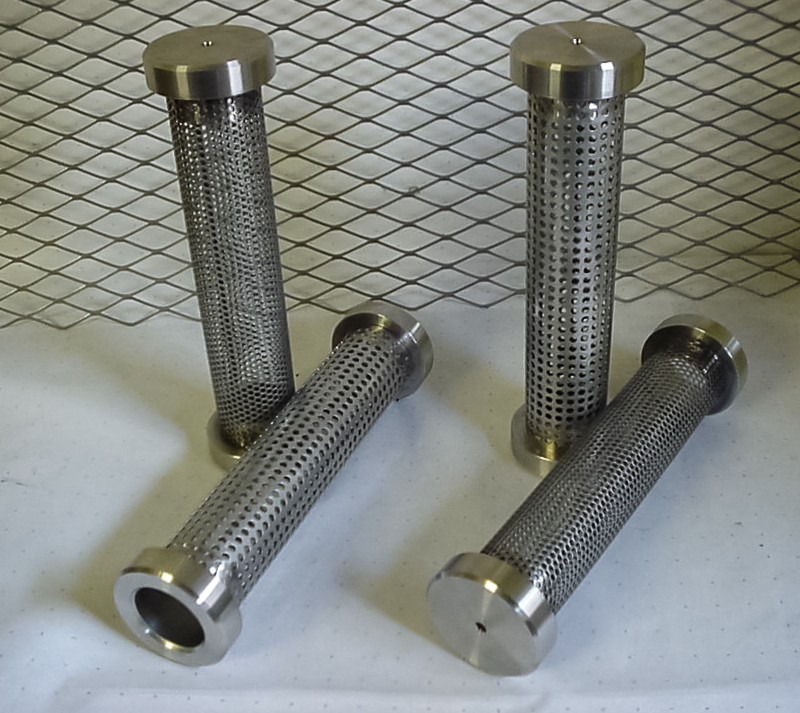 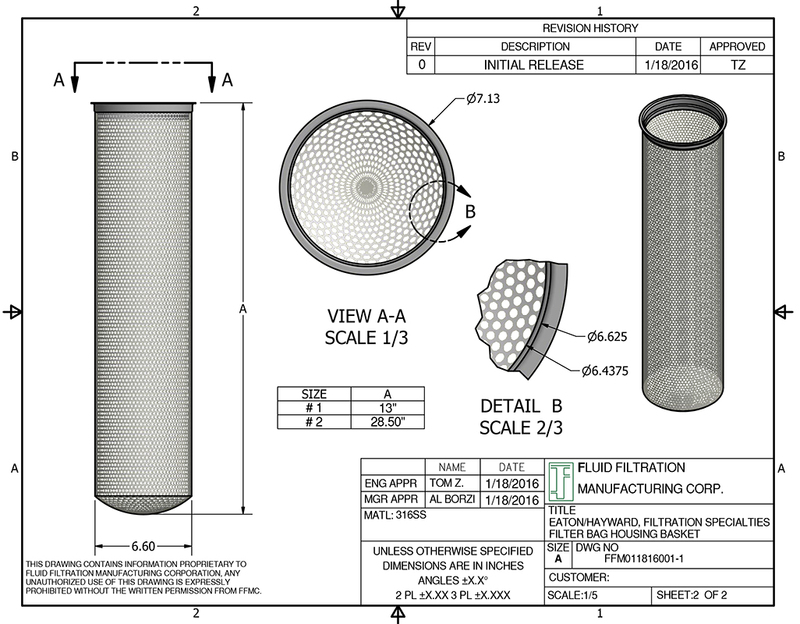 Replaceable mesh screens for model # 72 Hayward, Kraissl, and Fluid Filtration. 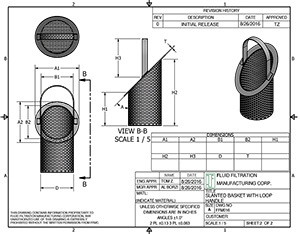 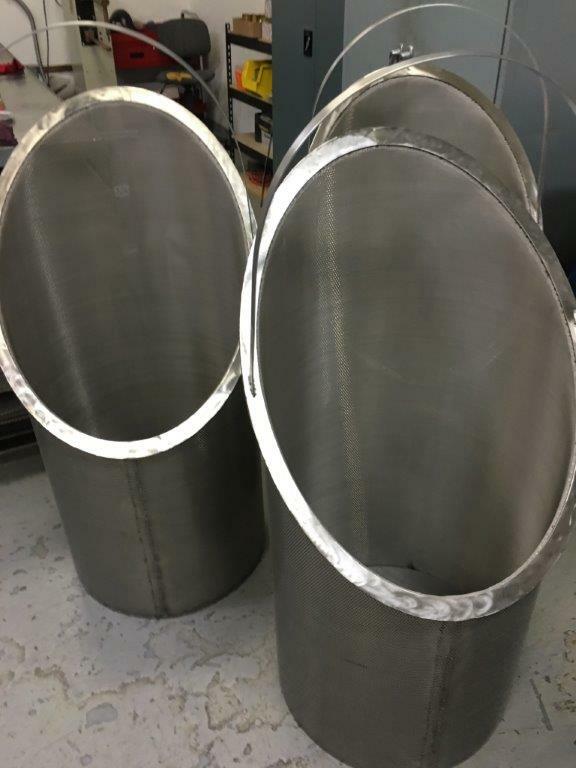 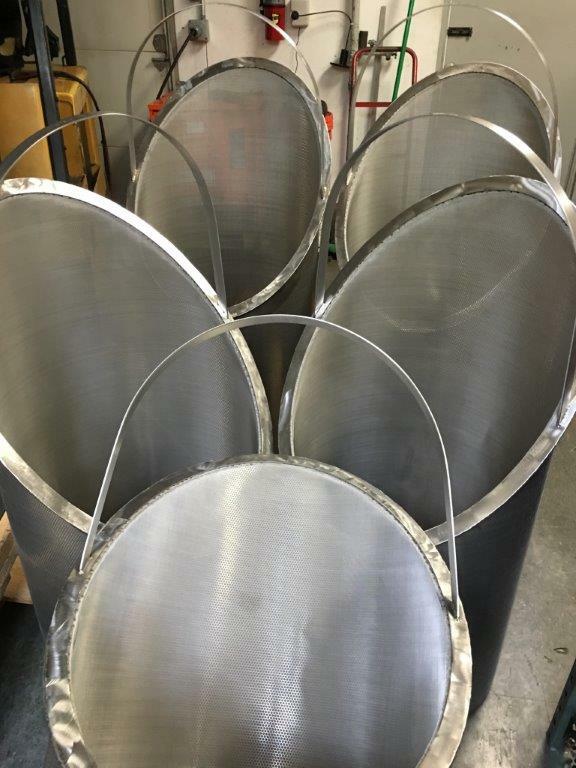 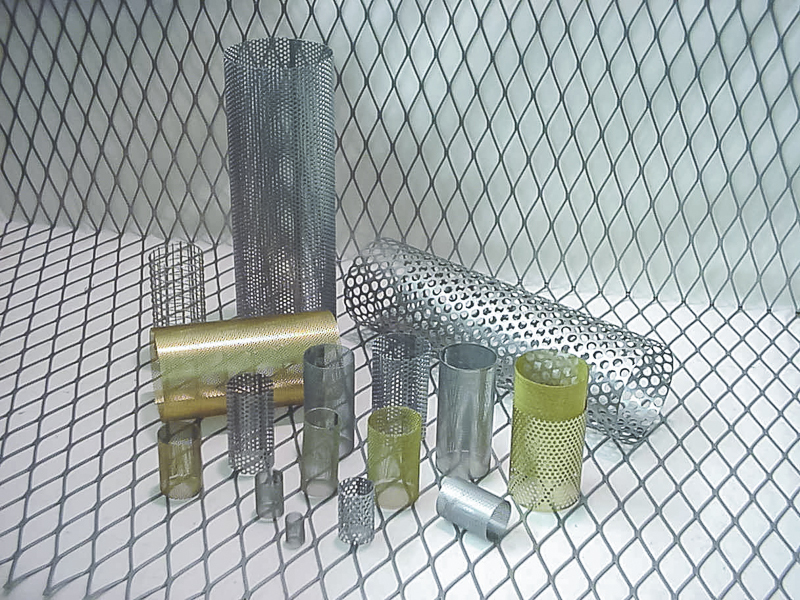 Inner horizontal and vertical bands available for mesh lined, titanium, Hastelloy, Monel, or Stainless Steel replacement baskets. 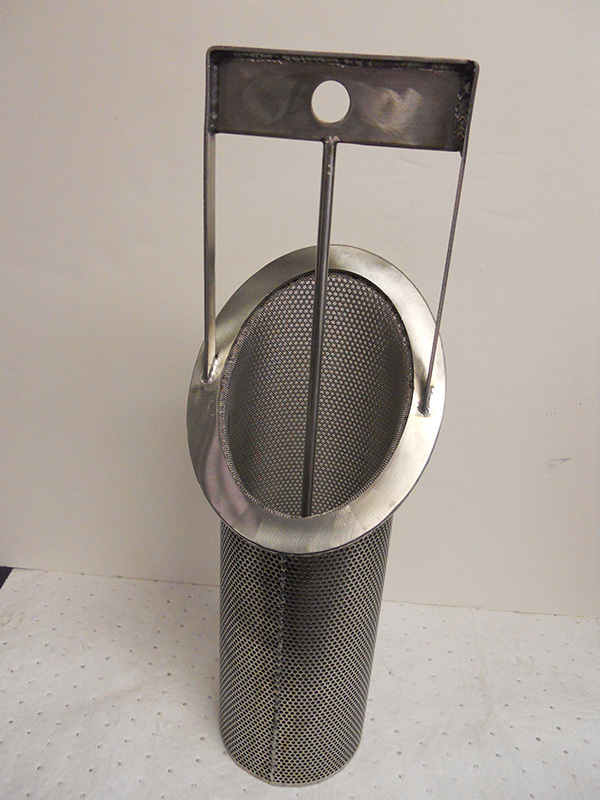 Lobster pot style convoluted fabricated Stainless Steel strainers for 10, 12, 16, and 18 inch Hayward model 72-73 simplex strainers and model 50-51 duplex strainers, lined with or without Stainless Steel mesh. 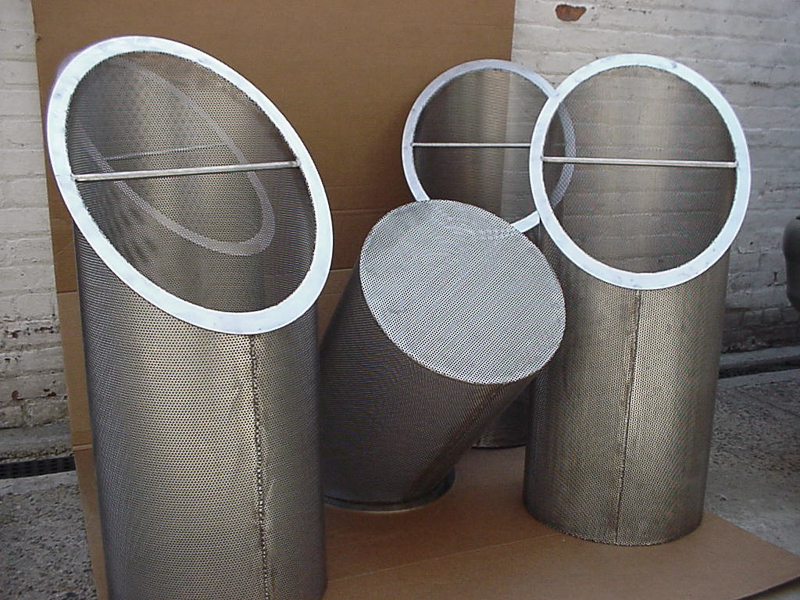 Also available in Monel material. 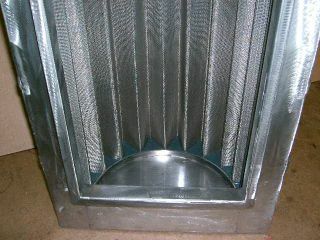 American Felt's filter GAF filter bag housing baskets with 10x10 mesh .47 wire with special Stainless Steel double O-ring flanges. 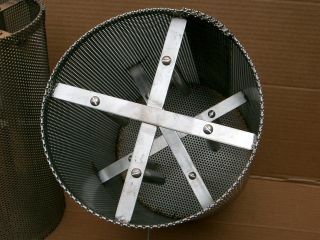 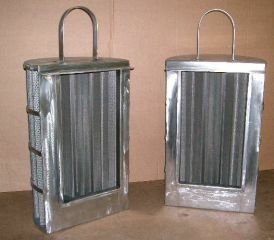 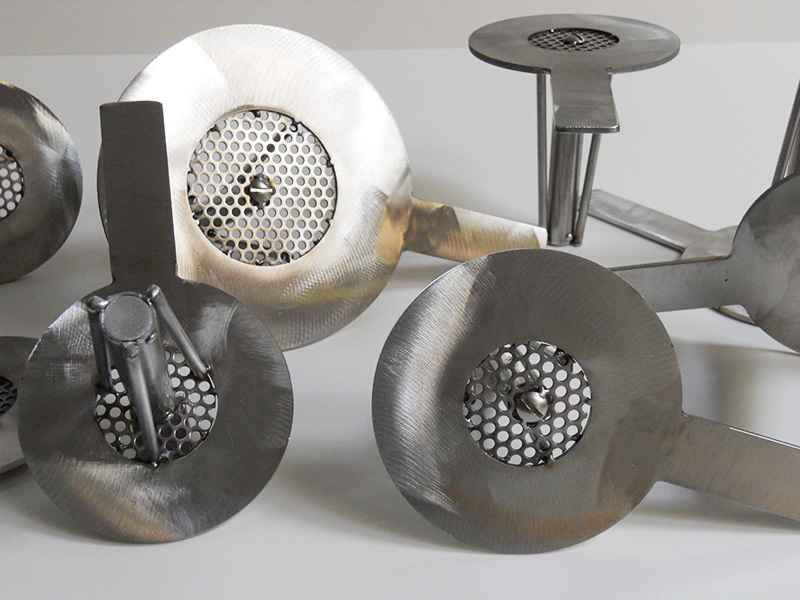 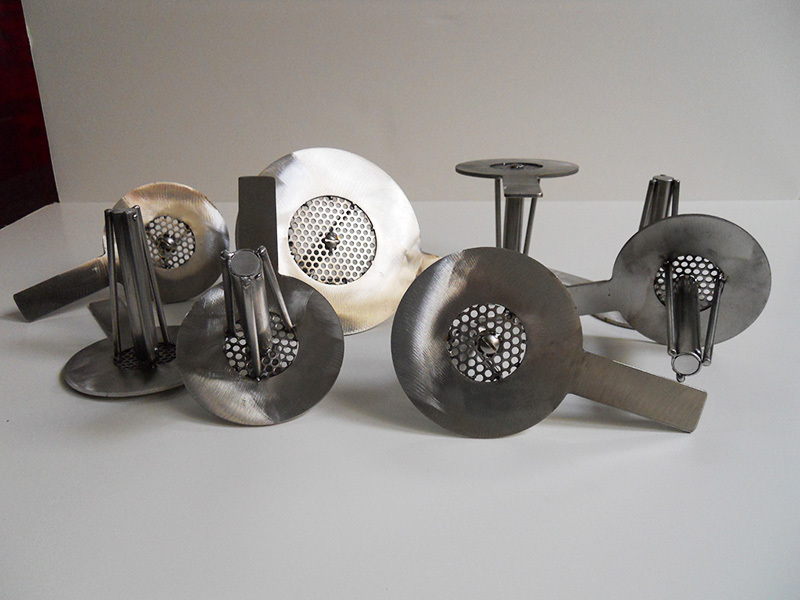 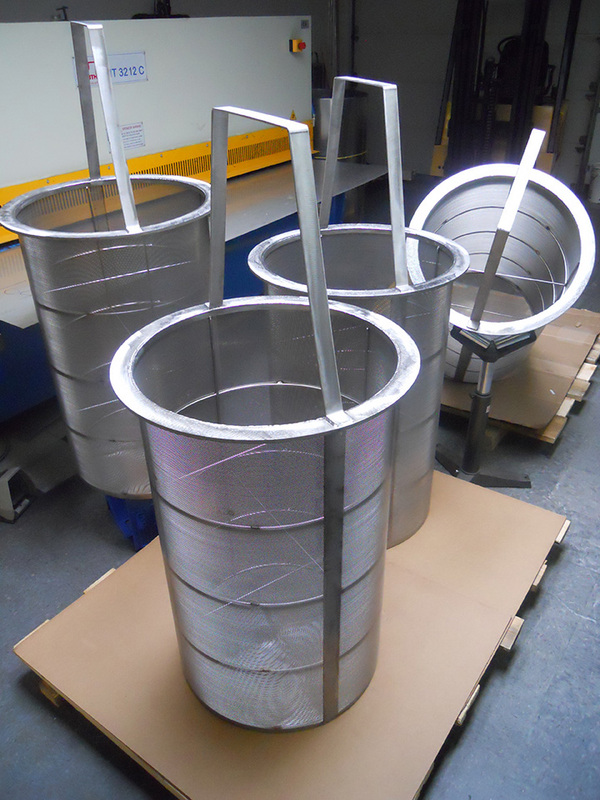 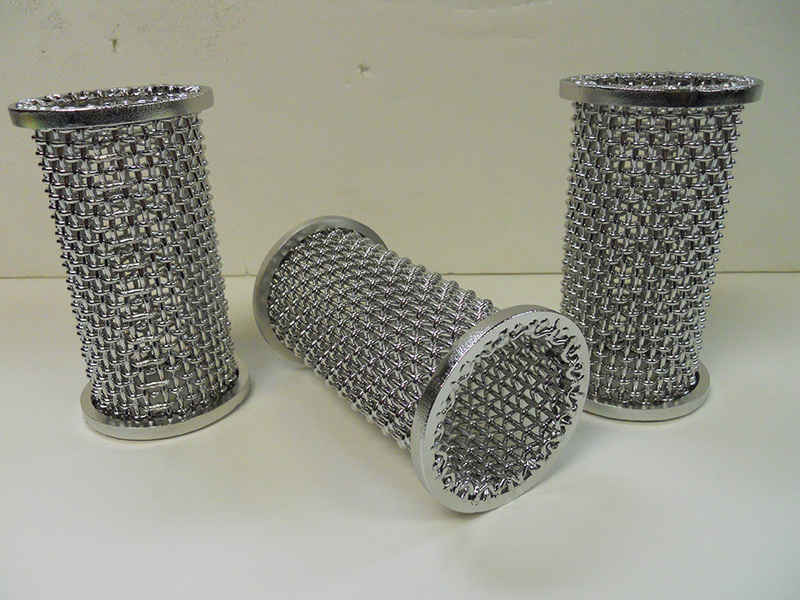 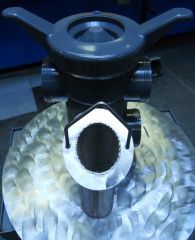 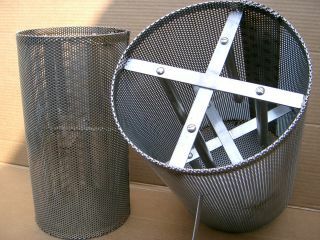 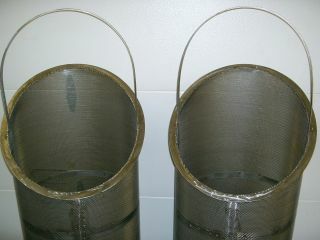 GAF and American Felt and Filter strainers/baskets available in all sizes, peforations, mesh and alloys. 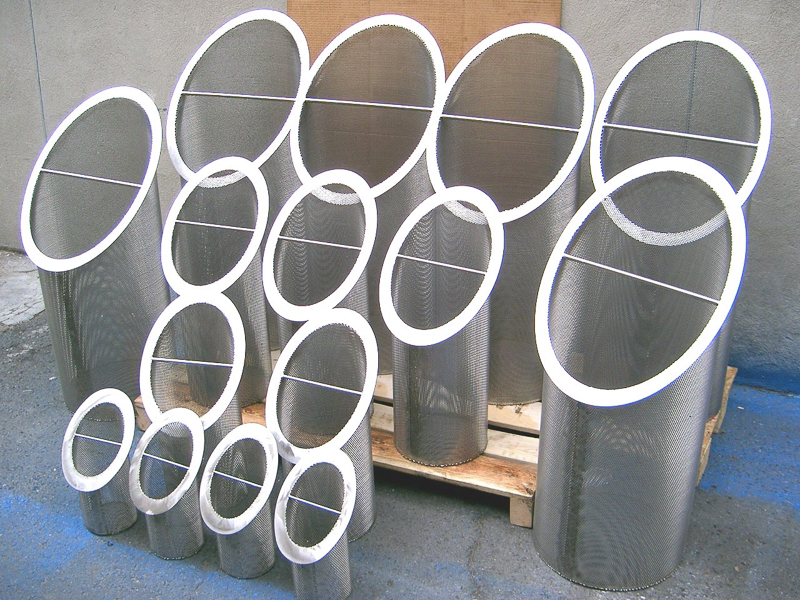 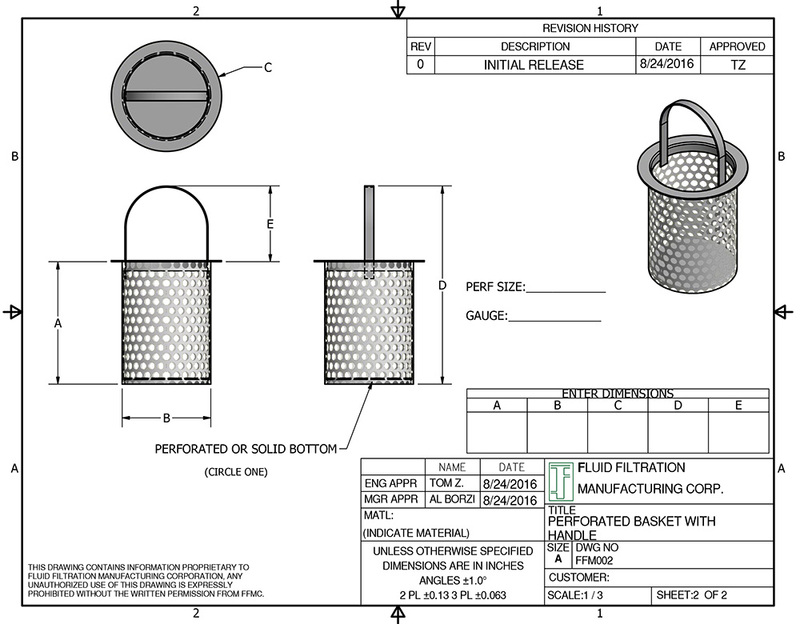 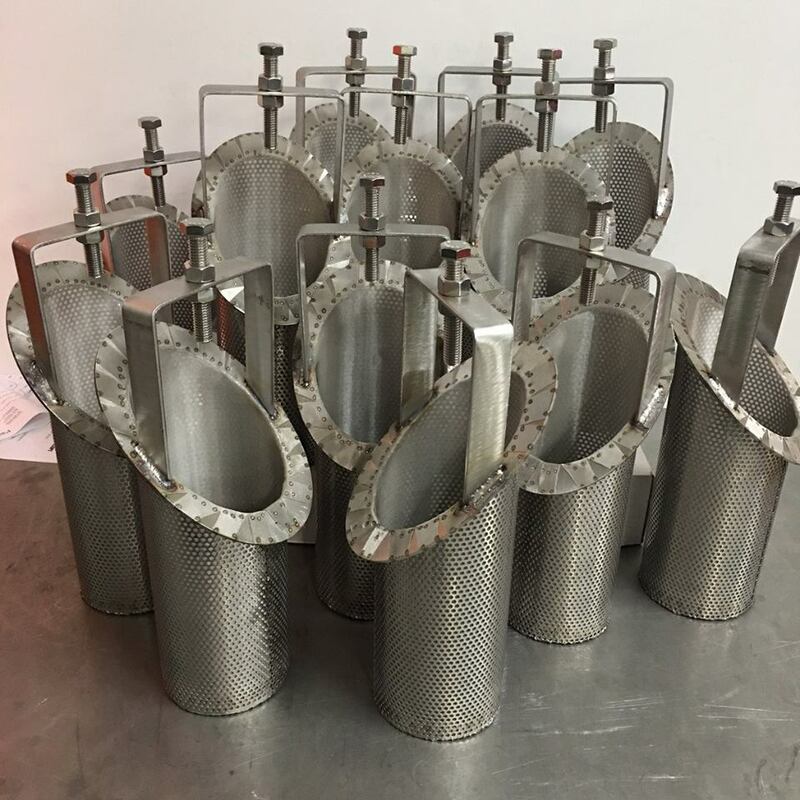 10 x 10 mesh, .047 wire Stainless Steel 316 basket strainers with Stainless Steel 316 flange and perforated or wire mesh cone or dome type strainers. 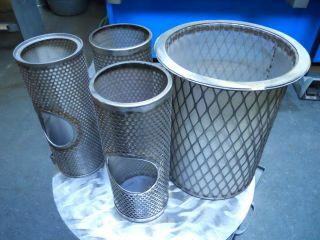 Stainless Steel zurn baskets with vareity of sizes and perforations. 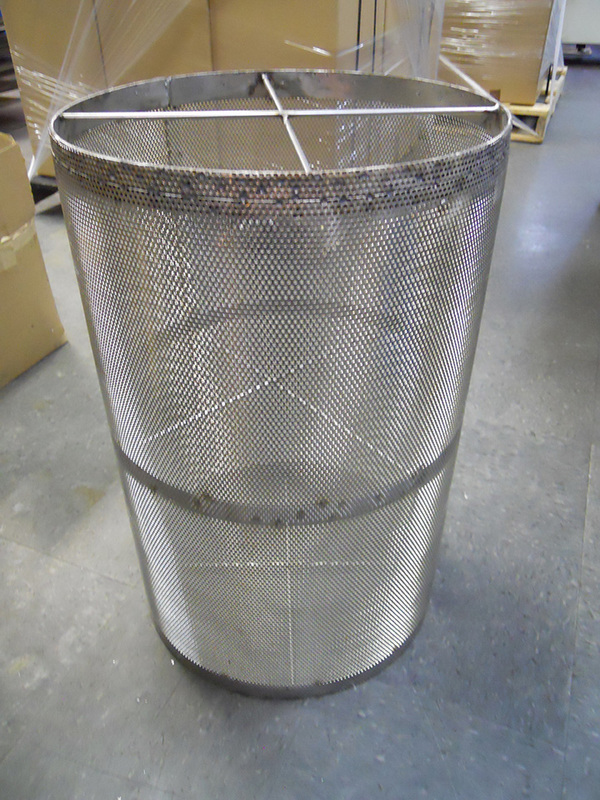 Stainless Steel 316 heavy duty slanted baskets with mesh liner. 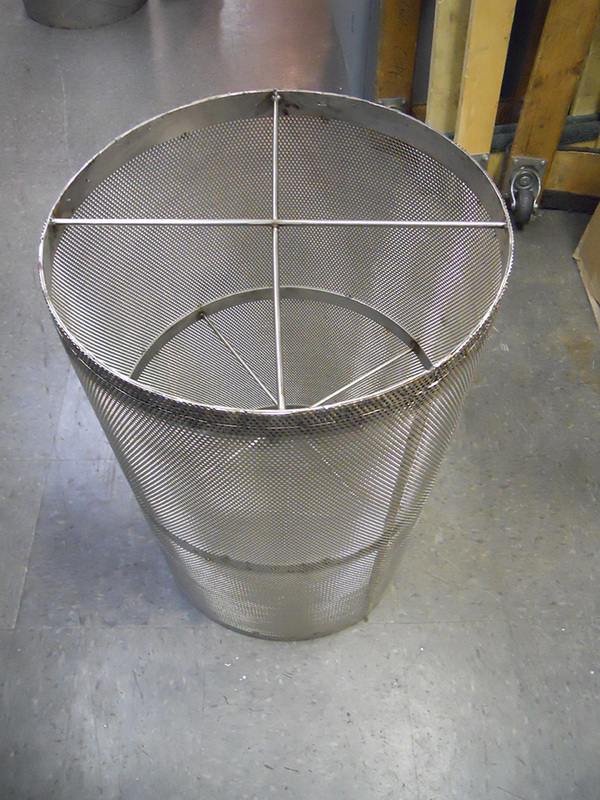 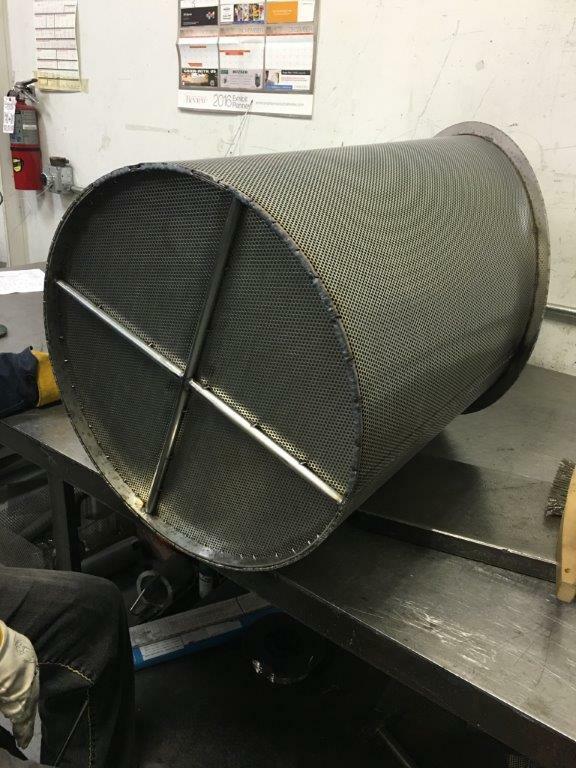 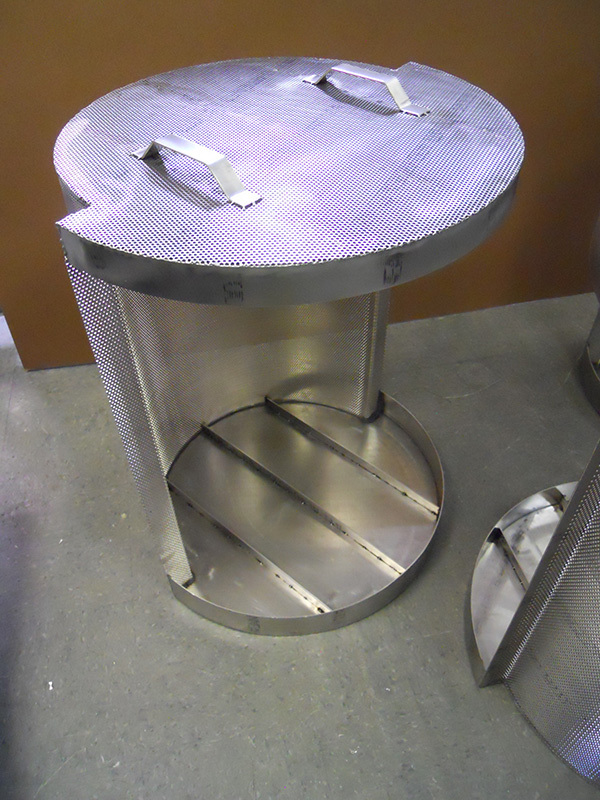 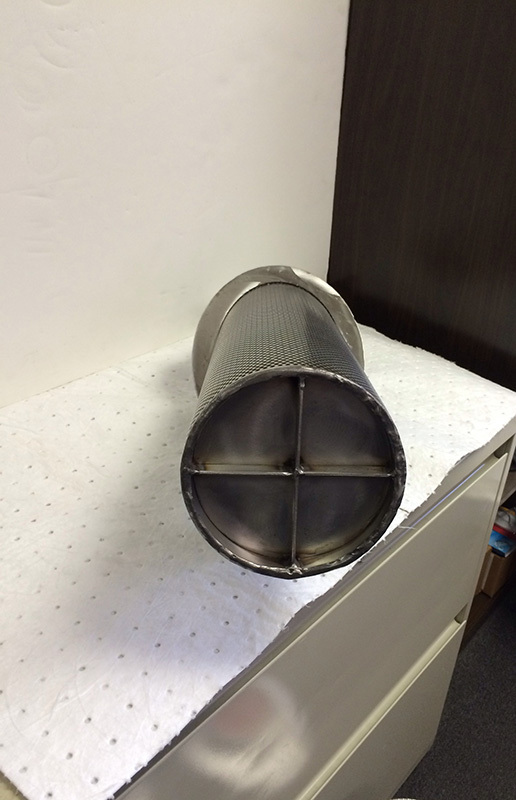 Heavy duty 1/2" thick flanged slanted basket. 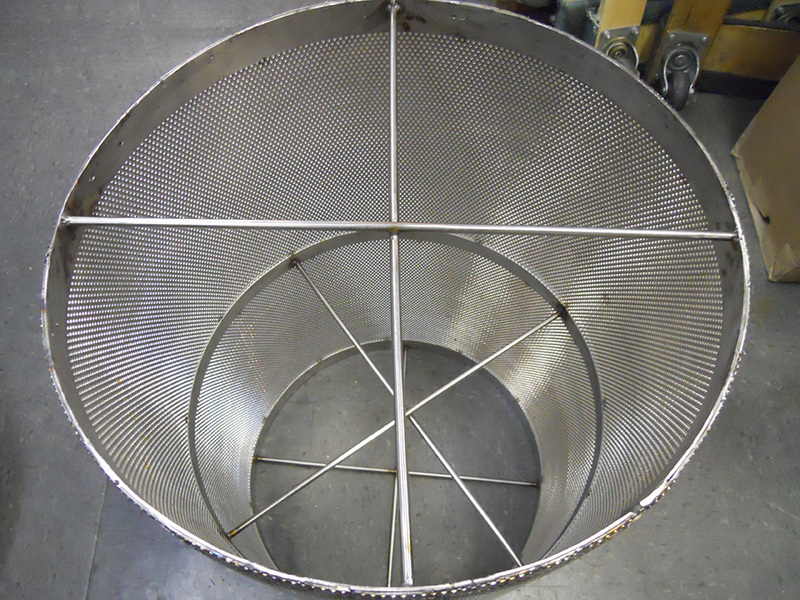 316 Stainless Steel 24.0" slanted basket. 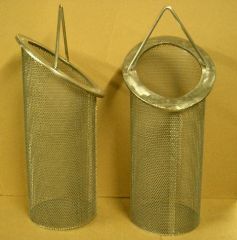 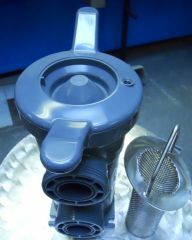 Use in "Y" type strainers. 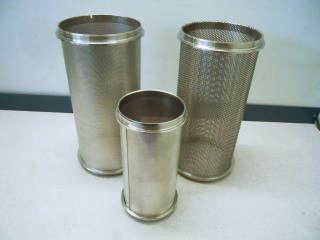 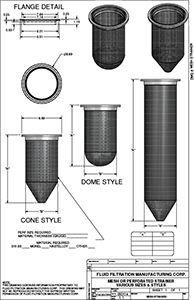 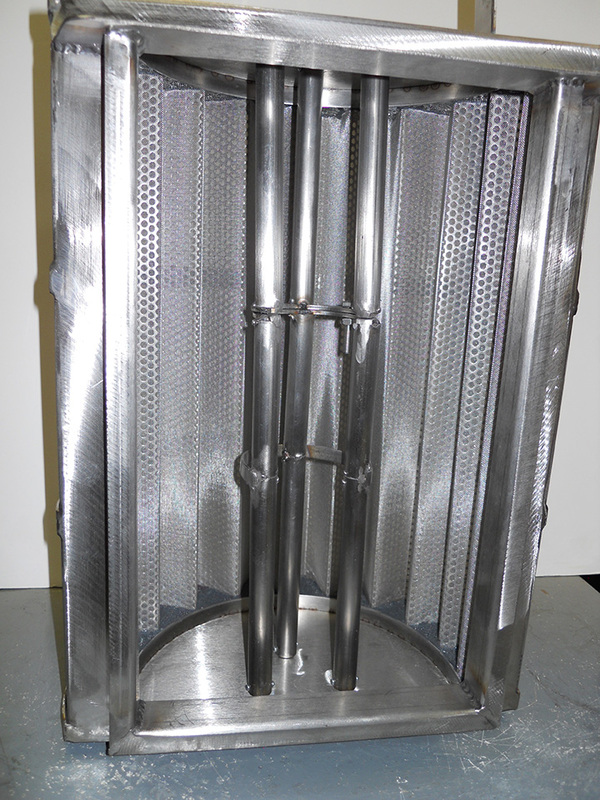 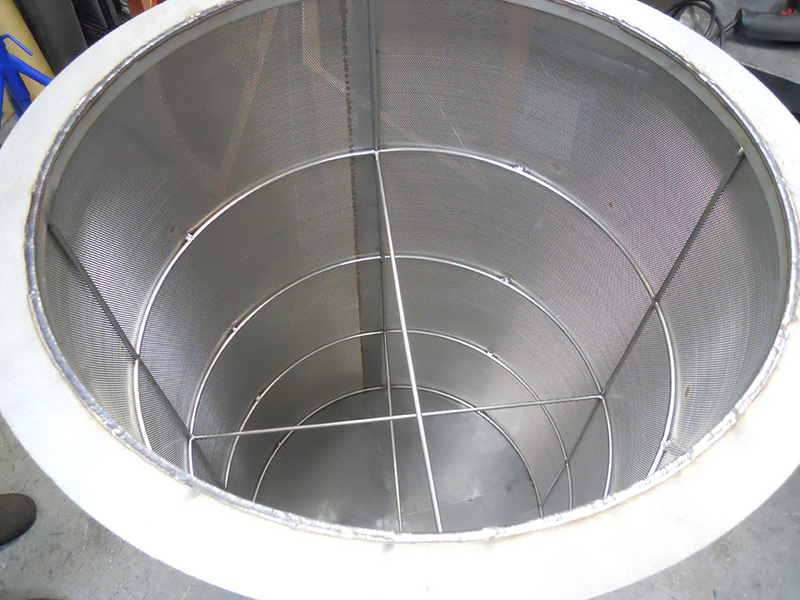 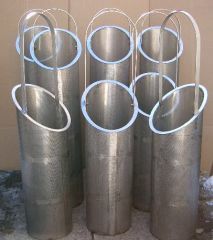 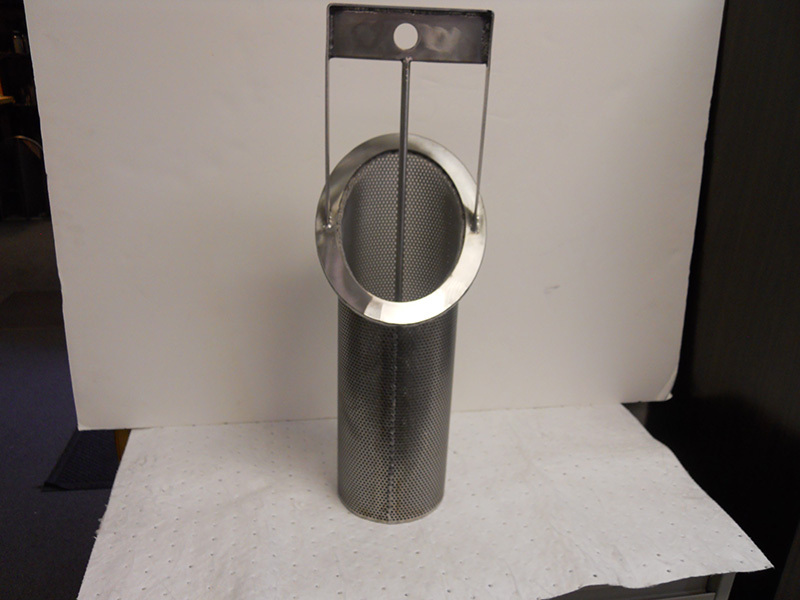 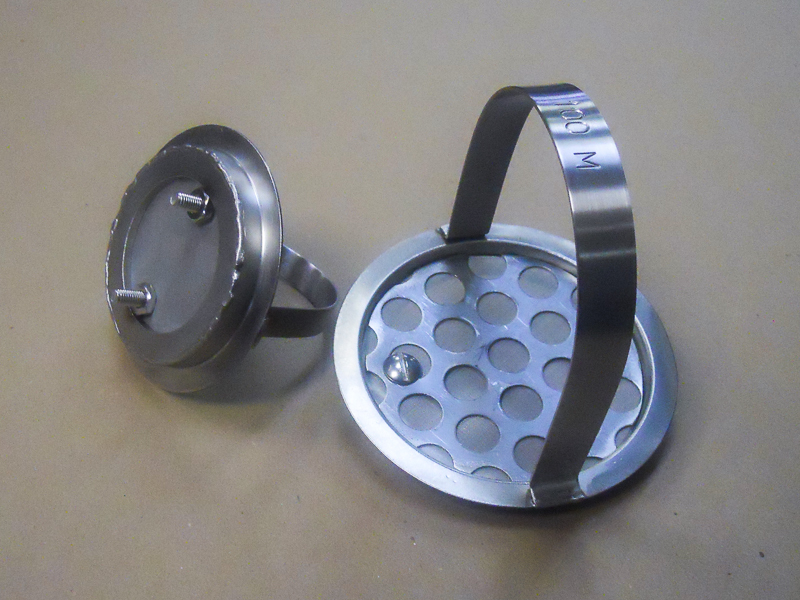 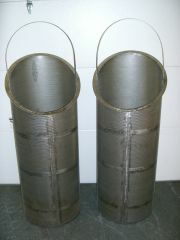 We manufacture and design a wide range of high and low pressure custom made metal filters. 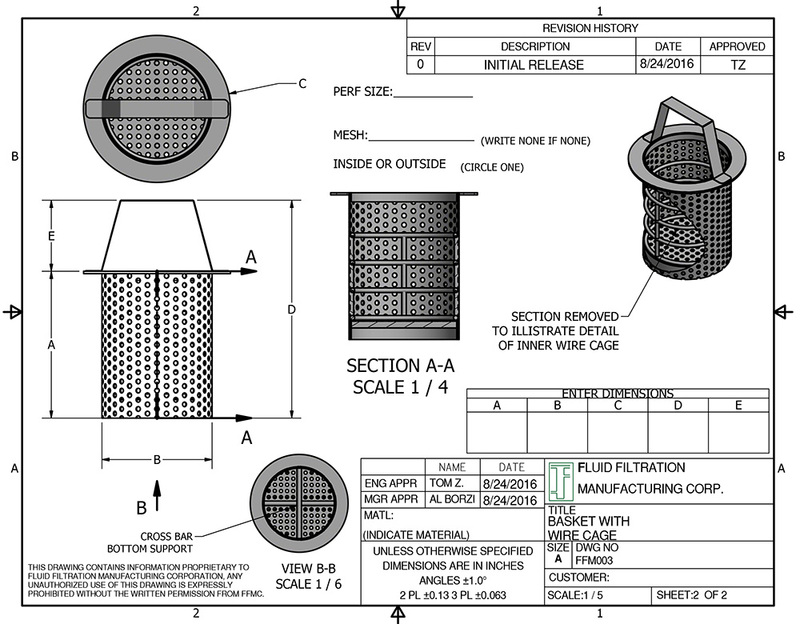 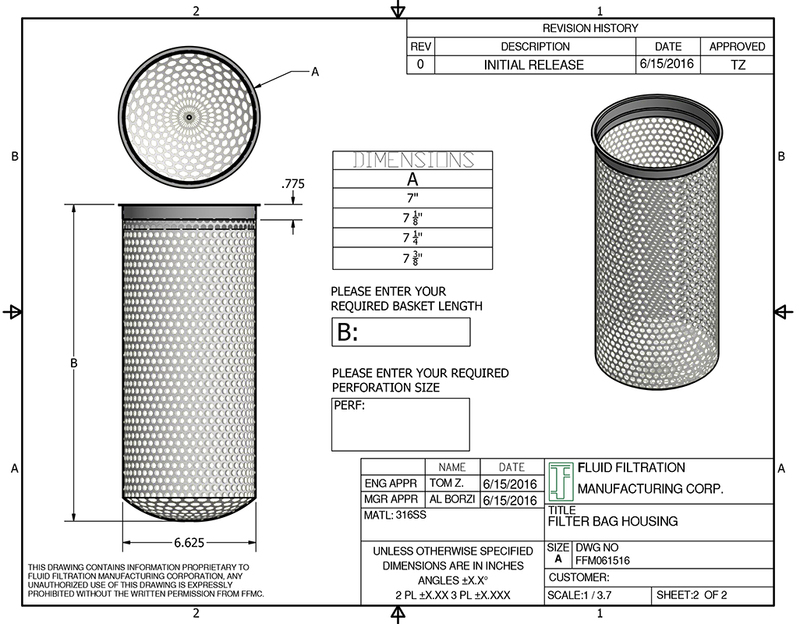 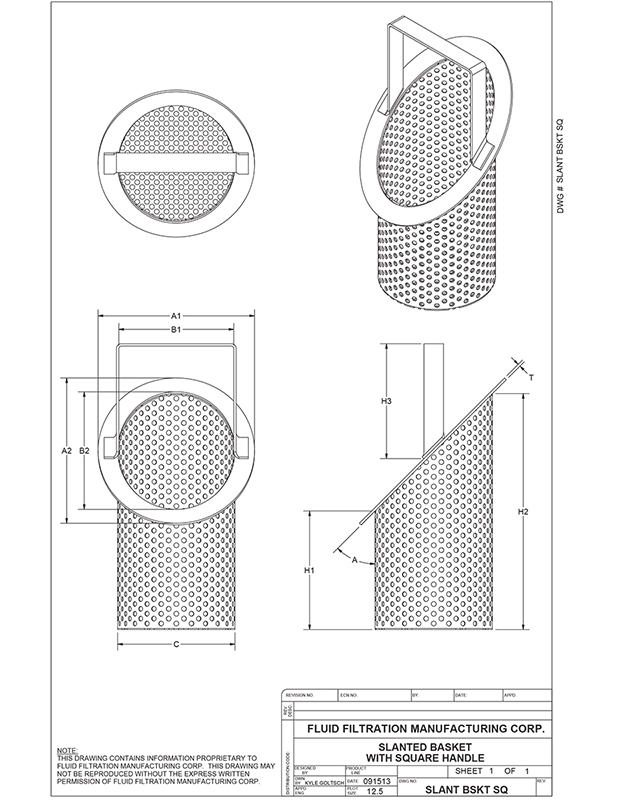 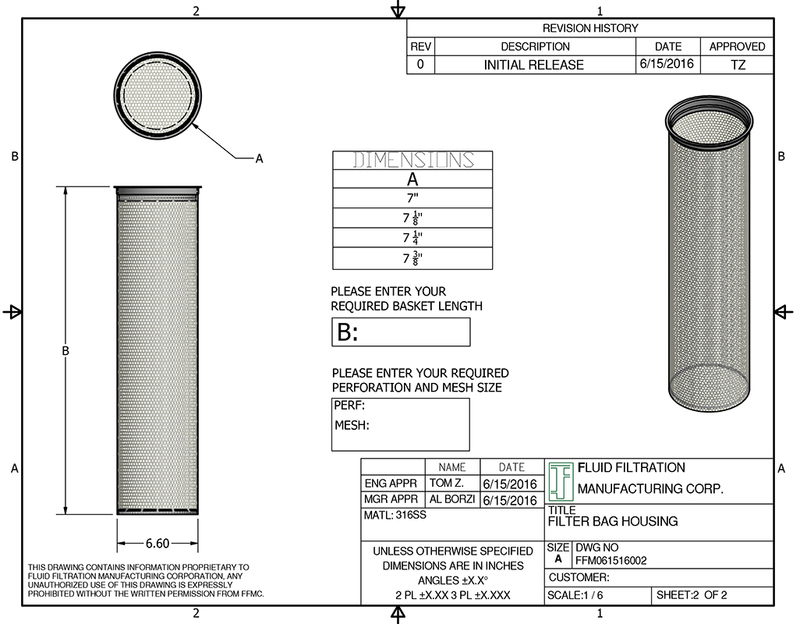 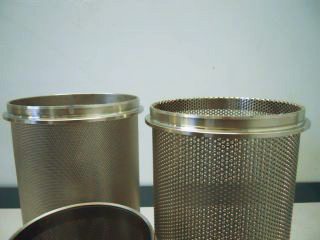 Perforation: Available from 1/64 inch to 1.0 inch round holes. 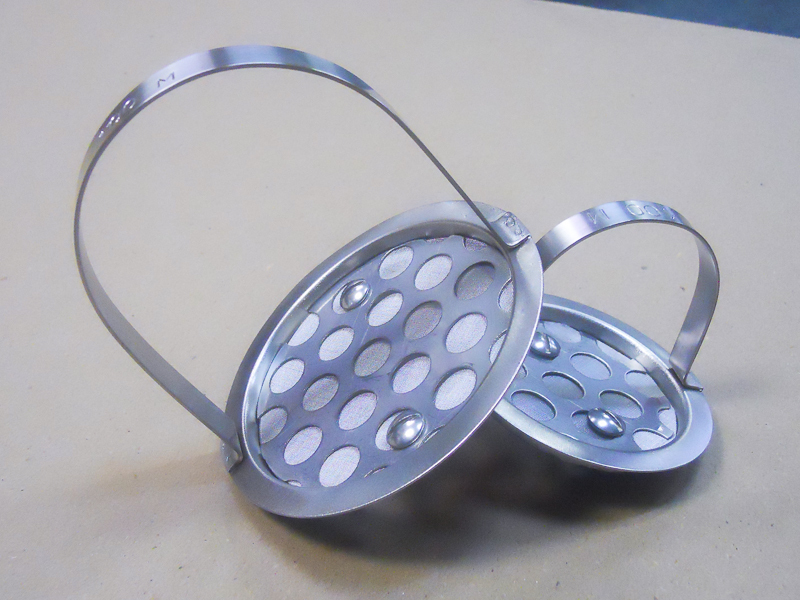 Material: Brass, Bronze, Stainless Steel alloys, Monel, Titanium and etc. 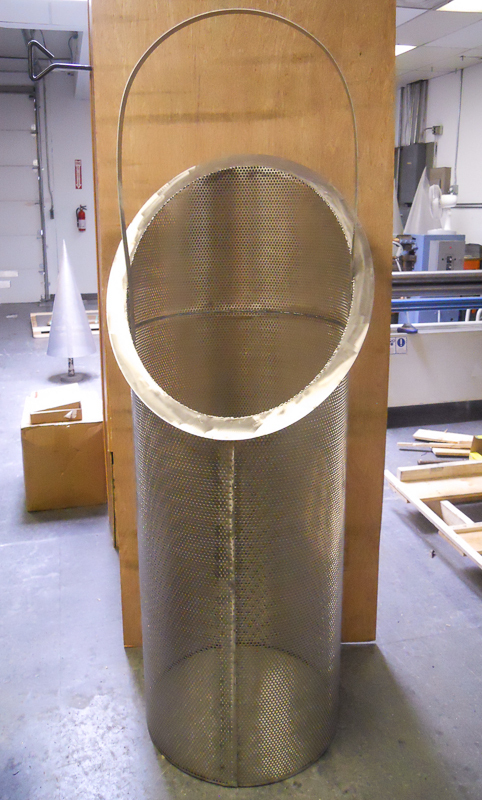 Thickness: Could be fabricated from 28 to 10 gauge. 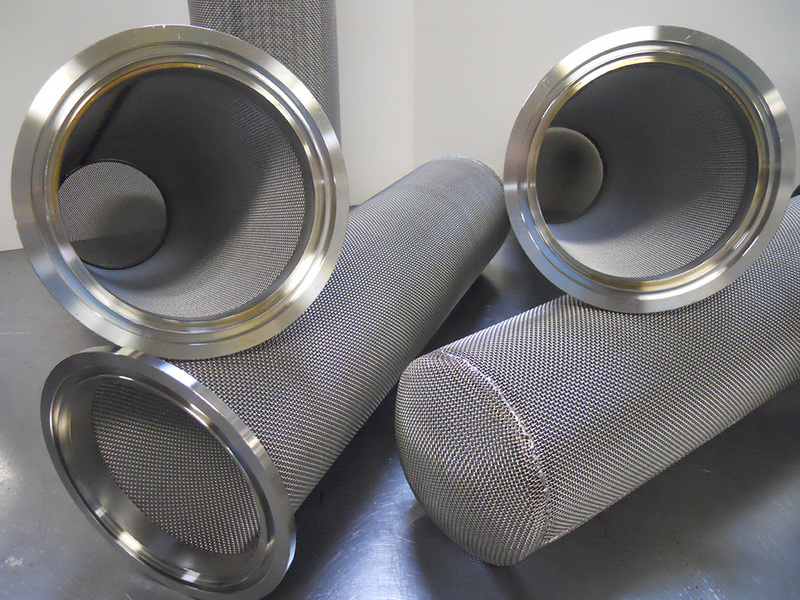 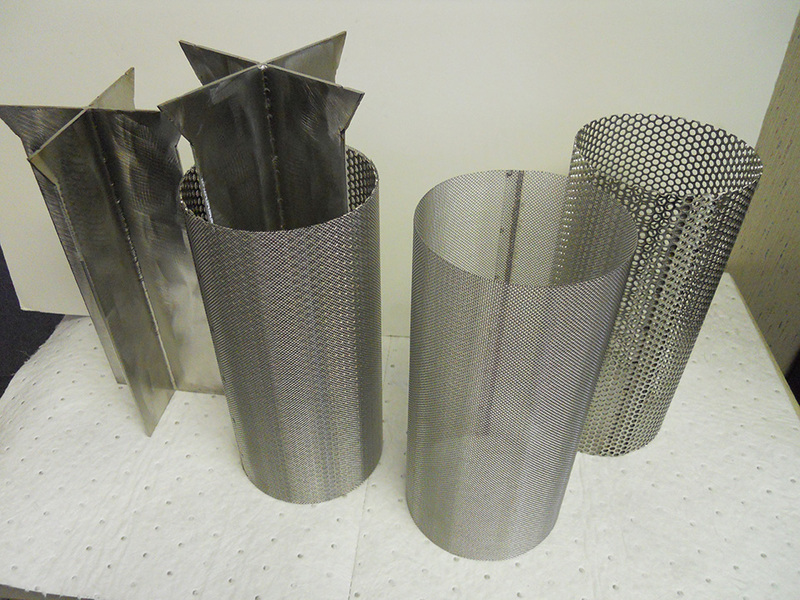 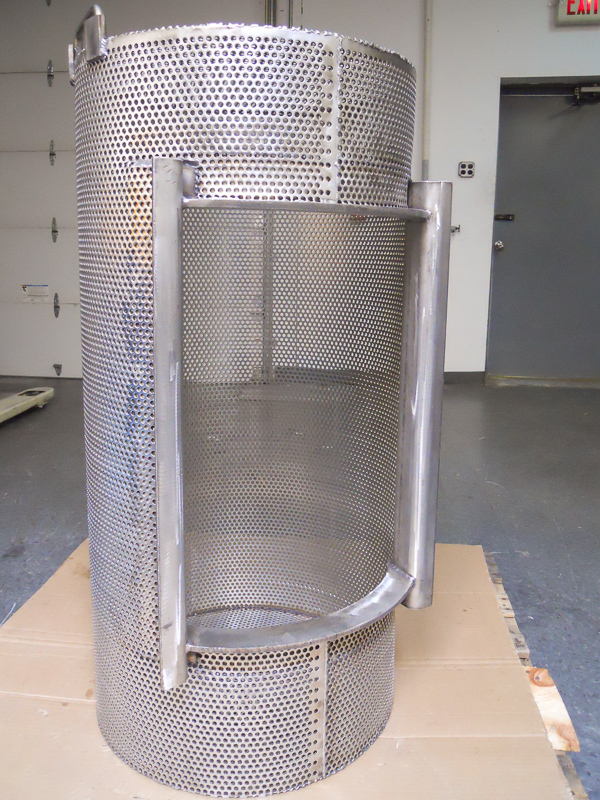 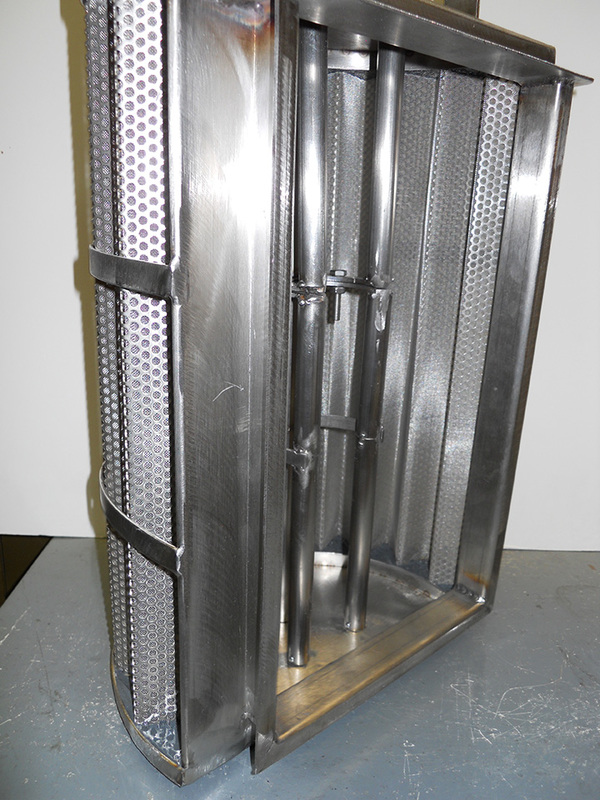 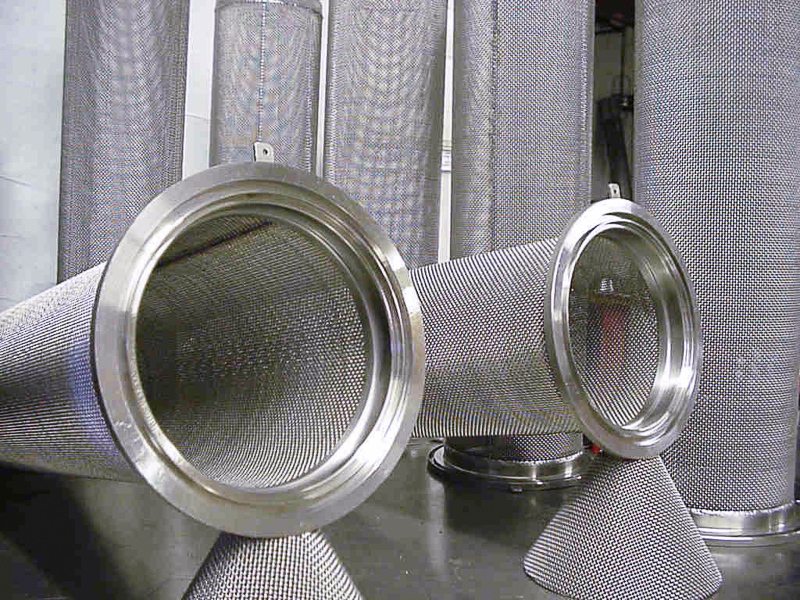 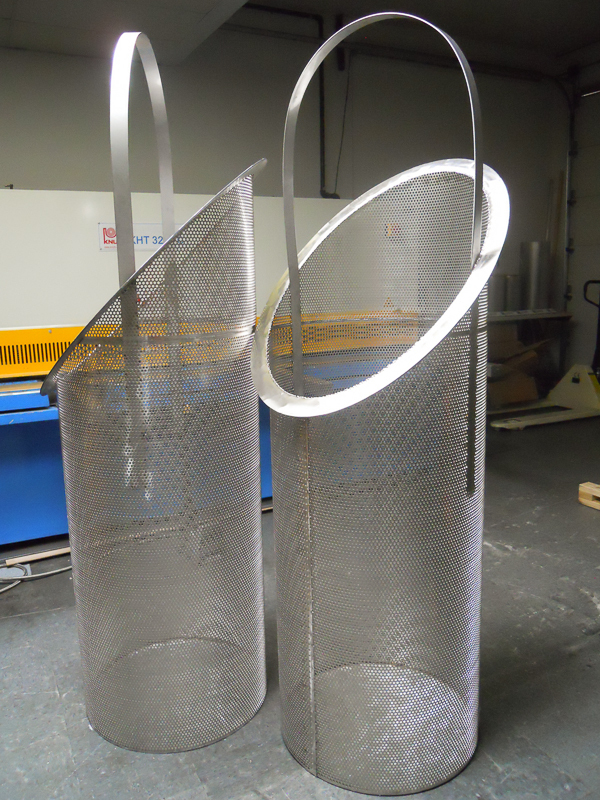 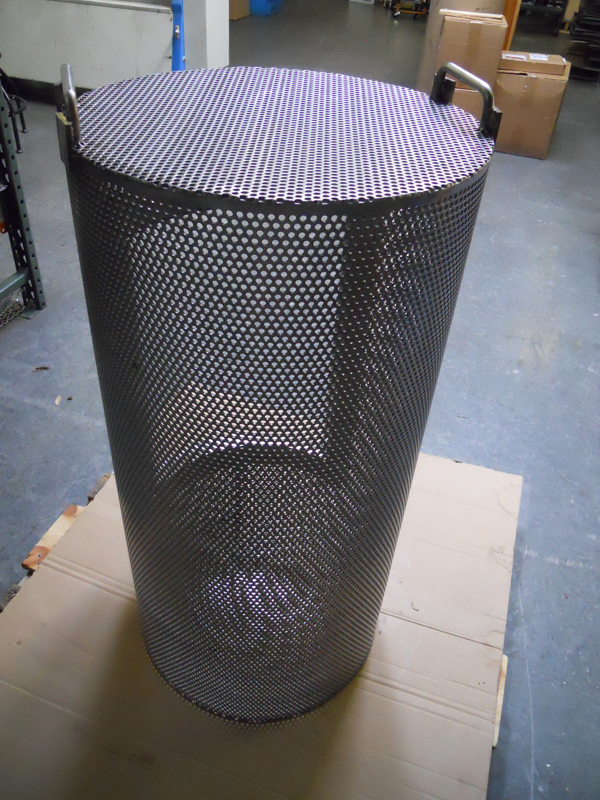 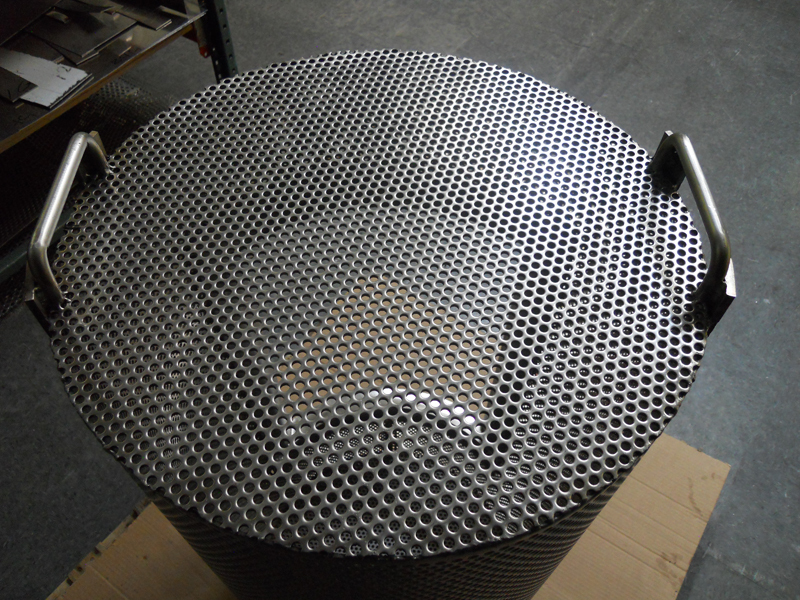 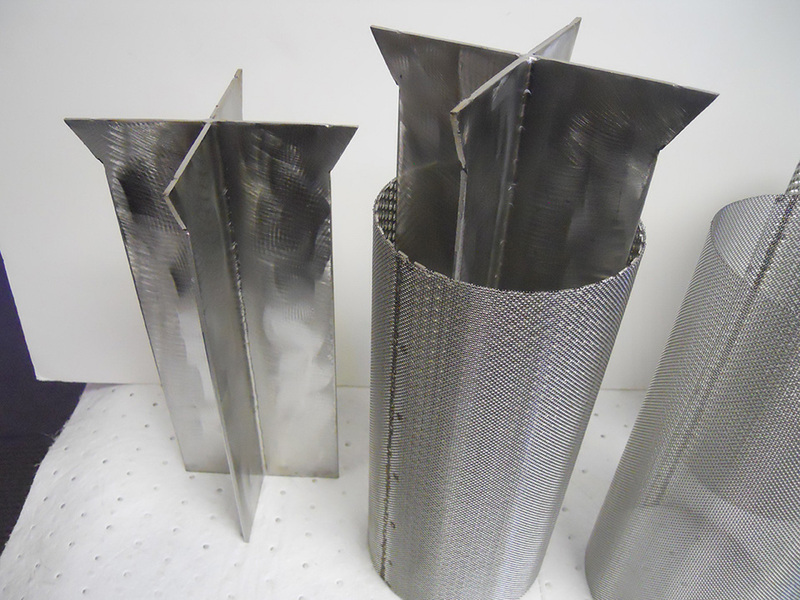 For finer filtration mesh screens can be incorporated with perforated sheet metals. 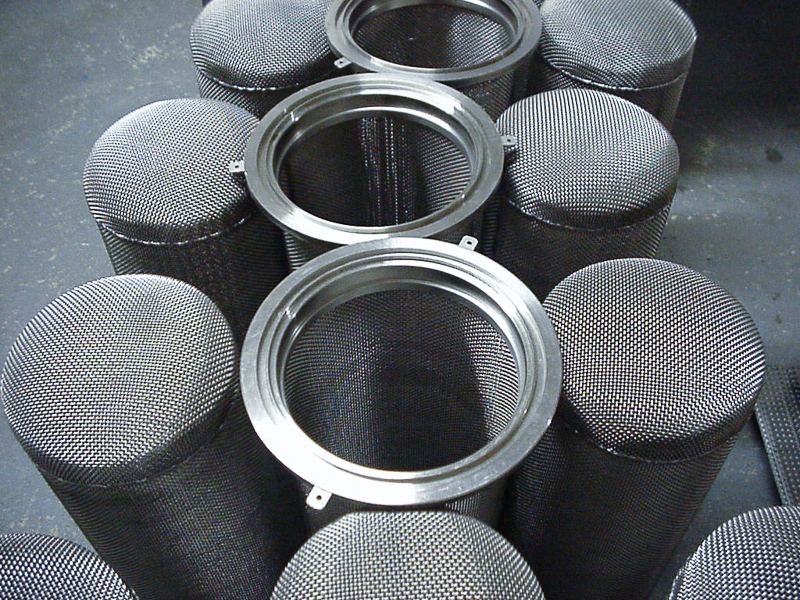 Our magnetic insert baskets are designedwith magnetic insertions to colletc sightless and microscopic metallicparticles during filtration. 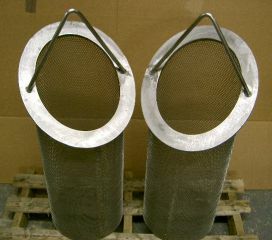 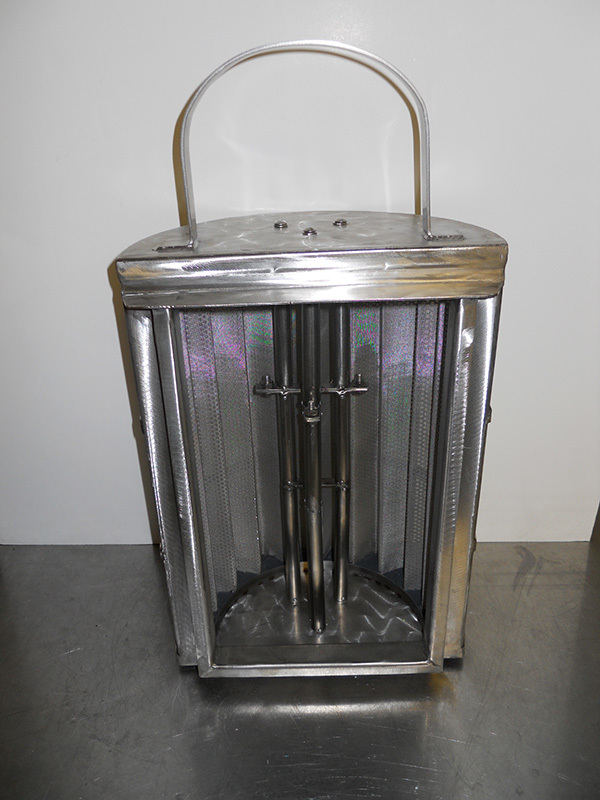 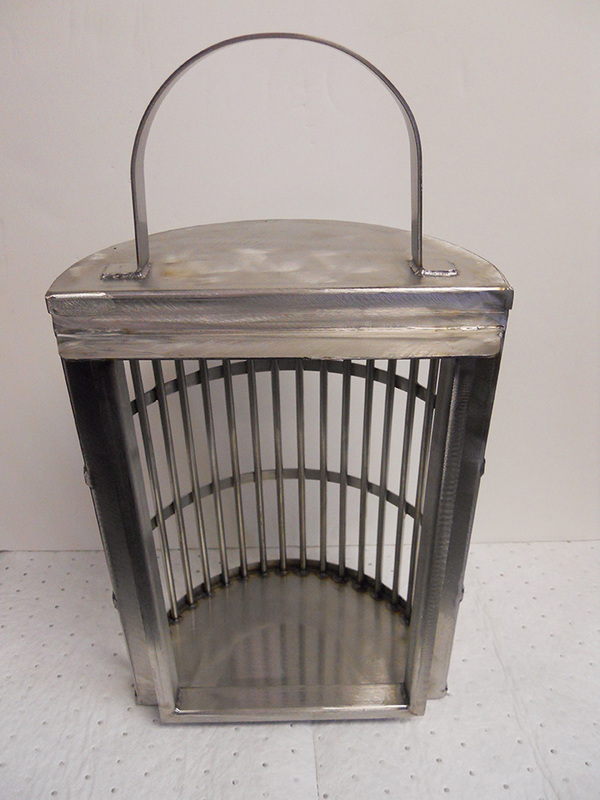 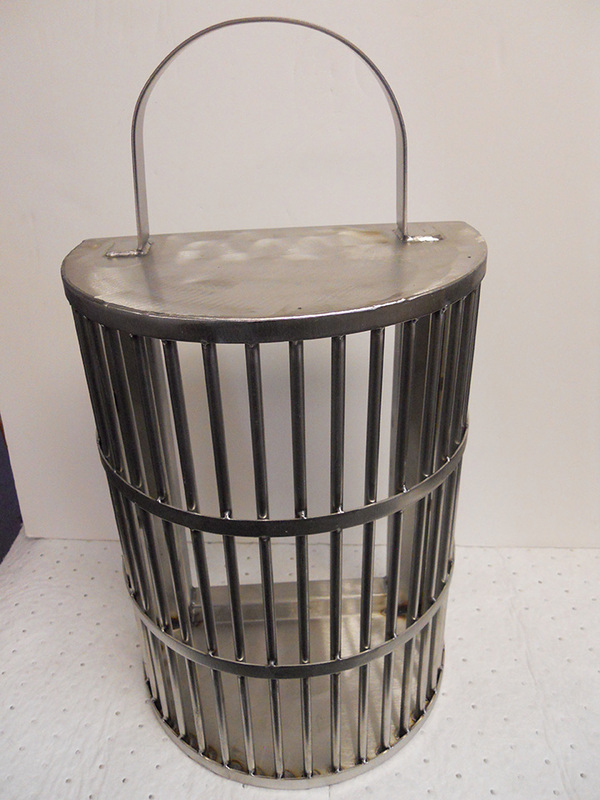 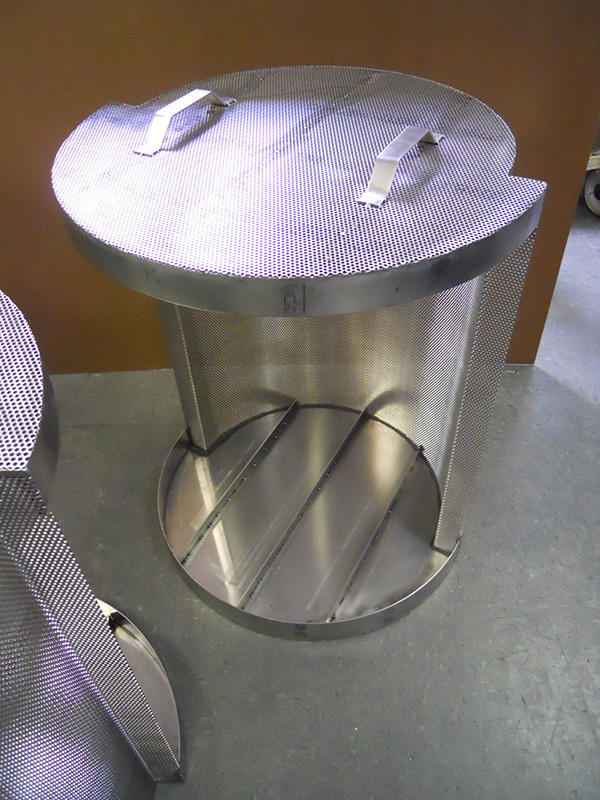 These baskets also protect your applicational equipment from premature wear and damages. 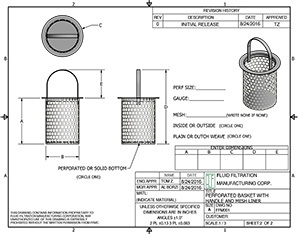 Magnets may be ordered separately by giving us the basket SKU (inside diameter) for which it is intended. 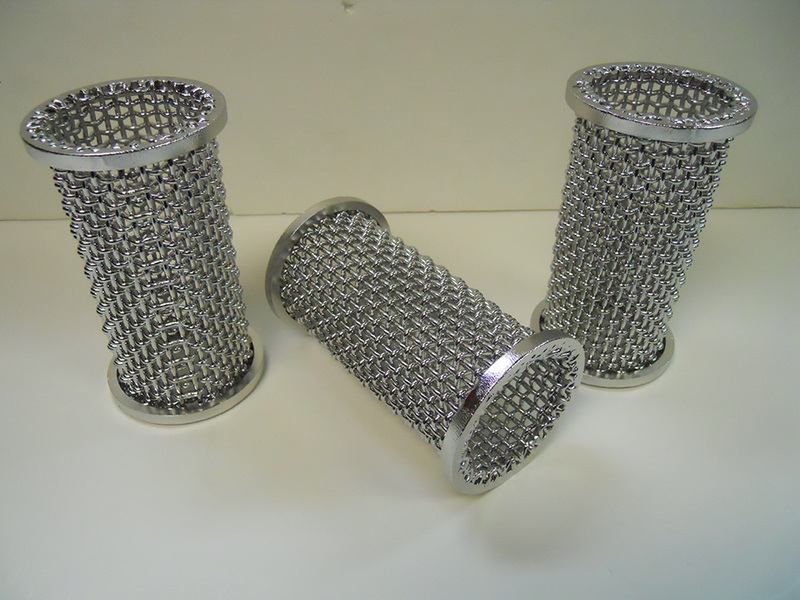 However, we suggest that you anticipate the need for magnets when ordering baskets. 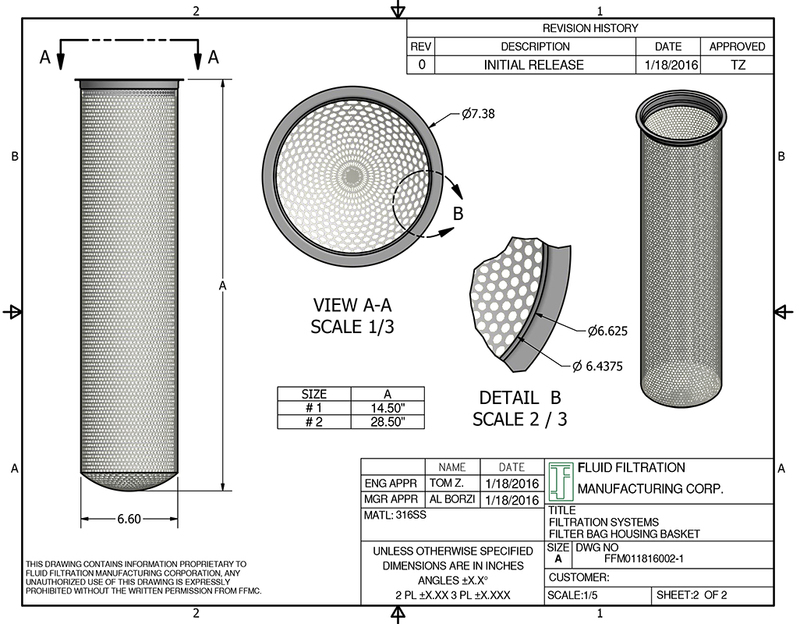 © 2019 Fluid Filtration Manufacturing Corp. All Rights Reserved.